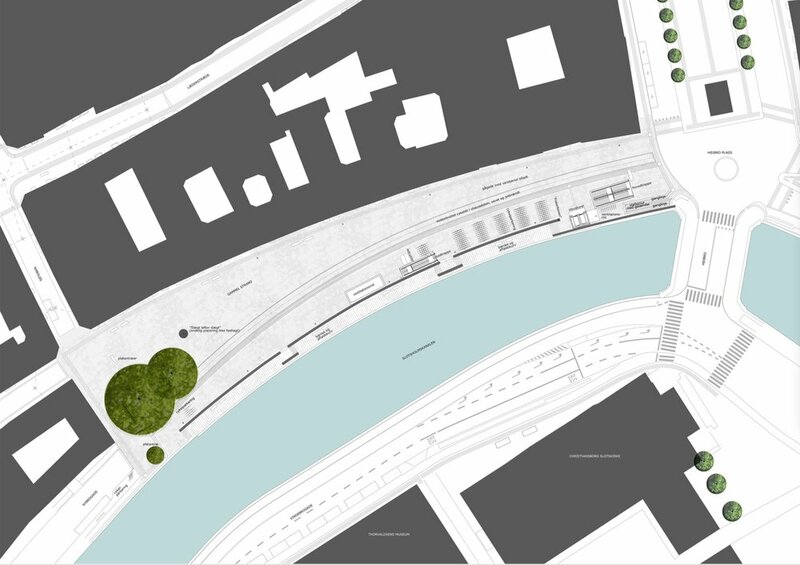 Three architectural and landscape design companies worked on the scheme - SLA Copengagen, Tredjure Natur and GHB Landskabarkitekter - and their online sites have more information and more images. It was impressive watching all this play through so quietly and smoothly - sort of flat pack for the the real pro - and I guess they didn’t find there were bits missing when they unpacked it at this end. More serious though is a rhetorical question ……. … this bridge is all about cycling, here in the city of bikes, but the cyclists are just shifting from one bridge to another. The numbers are pretty amazing - up to 40,000 cyclists are said to cross the harbour each day using the existing bridge - but will Lille Langebro encourage otherwise reluctant cyclists to abandon their car for a bike to travel between Amager and City Hall? It will be interesting to see figures for the bike traffic using the bridge over the next few years. As new and very substantial infrastructure, this has to be a big debit on the carbon account. Obviously Copenhagen is an optimal size with 600,000 people in the city area and about 2 million in the greater metropolitan area - there are mega cities but they have specific problems - concepts developed in Copenhagen could be applied to the vast majority of large cities - but Denmark is also trying out smart data systems in smaller communities. The concern is to make systems work together between different cities and across different systems and different standards. Generally, people in Denmark already have a proactive approach to the problems of climate change with a positive acceptance of new technical solutions that are being developed - from wind-driven energy to the control of cloud-burst flooding - and the report suggests that there could be a similar and favourable attitude to smart technology. The report emphasises that Denmark has a strong record for citizen participation which is clearly important. There is a high use of current technology in the country - 85% use the internet every day where the EU average is 65% - and the report cites the example of wind energy - a technology where Denmark is now a world leader. It is also interesting that the report identifies that Denmark is strong in design, architecture and technology and education and has a well-developed health system where the benefits of new technology are clear so citizens are receptive to change. Generally, good urban design is associated with liveability so people should be open to using smart technology if a user-centred approach is taken. There is a caveat. Danes appreciate good design so digital technology should be well received providing it is "simple, easy to use, and unobtrusive." Gammel Strand, now in the centre of the historic city, is approximately on the line of the foreshore and the first wharves of the early settlement and, up to the late 16th century, someone standing here, could have looked south, across the short distance to islands where the castle was built, and, beyond, the north shore of the island of Amager well over a kilometre away. Now, Gammel Strand has the canal along its south side with Borgen, the castle, on the other side of the canal. The space gradually widens out to form what is, in effect, a long triangle and across the west end is a large courtyard house, now the ministry of culture, and then there are two blocks of buildings, beyond the courtyard house, between there and Rådhusstræde, with the line of the building frontages of Gammel Strand continuing on as the city side of a narrow lane that is first called Snaregade and then, beyond a cross street Knabrostræde, continuing as Magstræde. 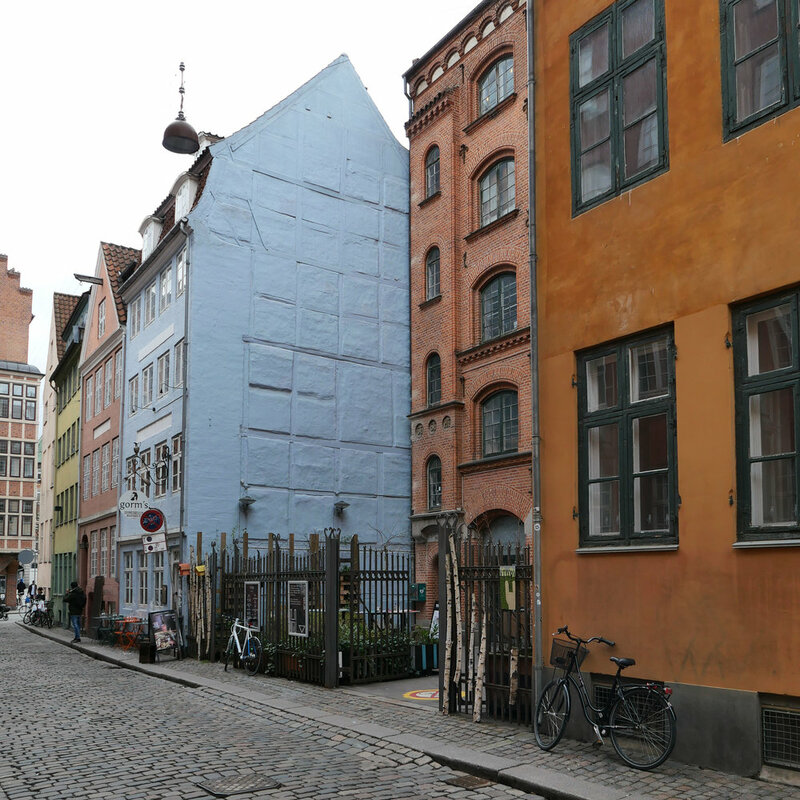 This narrow lane, Snaregade and Magstræde, is just 7 metres wide at the Gammel Strand end and barely wider along the whole length. This is essentially a street with no space, let alone space for Life Between Buildings. The buildings vary between two and four floors, some with half basements and with relatively narrow but irregular plot widths. In this party of the city you get a very clear idea of just how tightly packed the buildings were within the city defences by the late middle ages. Many of these buildings, close to the wharves, appear to have been owned by merchants and there would have been workshops as well as store rooms and living accommodation here - some of it quite grand. There is little space for any street furniture and few places to stop and no seating but actually it is one of the most beautiful and certainly one of the evocative streets in the city. It demonstrates many of the points mad by Jan Gehl in his book Life Between Buildings. For a start, the narrowness means that the details of the building become much more important as you are walking hard against the frontages, and you can see, where you cannot look directly into the windows of ground-floor rooms, just why householders gained privacy by raising the lower rooms above a half basement of storeage space or workshops so the ground-floor rooms are actually half a floor above the street or in grander houses the main living rooms could be on the first floor. Also important is that although short - just 700 metres for the two streets in line - the frontages of the houses curve in and out so you cannot see from end to middle - let alone end to end - so you see more of facades ahead even though the street is so narrow. Signs become important and few of the buildings had or have shop windows … a relatively late introduction in most cites and towns. The street is as attractive as it is because of the variety and the quality of the historic buildings but it is important that the street has setts rather than tarmac. There are narrow foot paths but note virtually no yellow lines. One of the most civilised aspects of the historic centre is that Danish drivers generally respect parking restrictions with simple signs and little more than a small yellow triangle on the kerb. Only in two places does the street widen out. At the middle where Snaregade and Magstræde meet at Knabrostræde it looks as if the house at the north-west corner has been rebuilt as some stage as as L-shape against the adjoining buildings rather than as an L-shape along the street lines. Towards the west end of Magstræde, a five storey brick pakhus or warehouse for Sthyr & Kjær, sugar merchants and makers of matches, was constructed in 1903. The street frontage was set back just over 6 metres to create a forecourt the width of the building - 11 metres wide - presumably for loading and unloading but also to allow more light in through the windows here now 13 metres rather than 7 metres back from the buildings opposite. This square in the centre of the historic centre is on the land of a Fransciscan monastery founded in 1238 and closed in the late 16th century when the land was used for houses of various sizes. Most were rebuilt after the fire of 1728. This is now one of the most picturesque old squares in the city but is a bit of a hidden gem tucked away on the north side of Strøget - The Walking Street - behind Heligaandskirken. 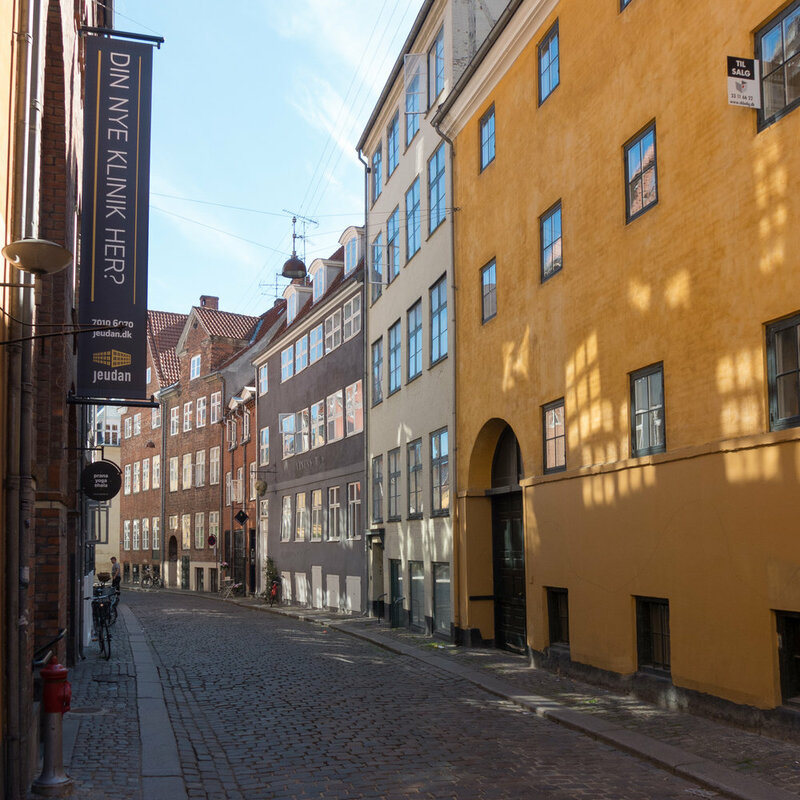 It is a triangular space about 70 metres long and just 45 metres wide at the inner end and 20 metres wide at the east end where the narrow end of the square has the street called Niels Hemmingsens Gade runnng across. 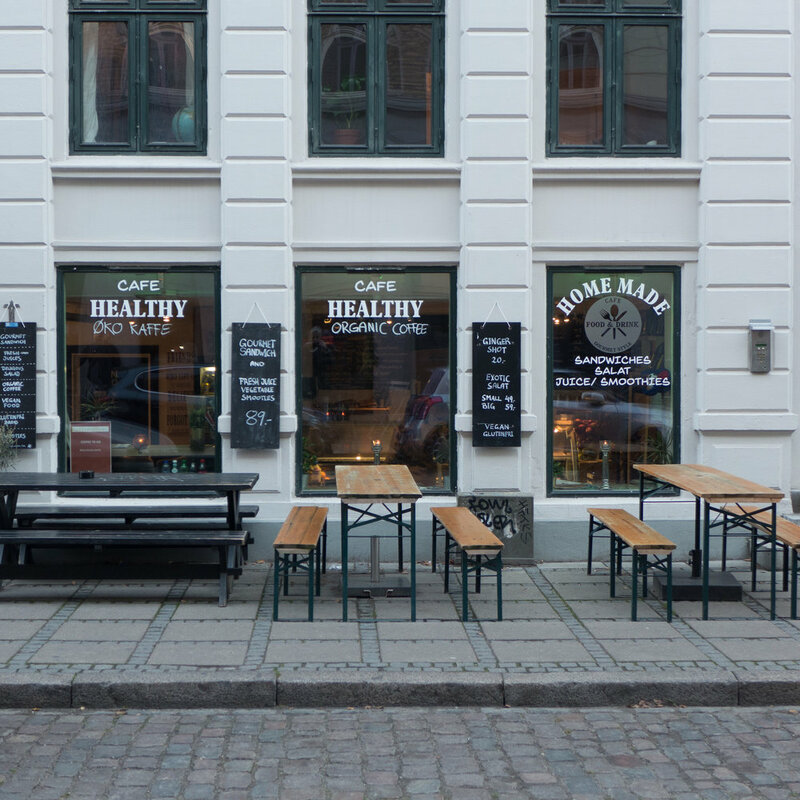 Most of the entry points into the space are through alleys or secondary pedestrian spaces off the square such as Kejsergade and the space is covered with setts and is free of vehicles apart from access for deliveries. Around the square are cafes and restaurants that have tables outside and there is surprisingly very little street furniture. 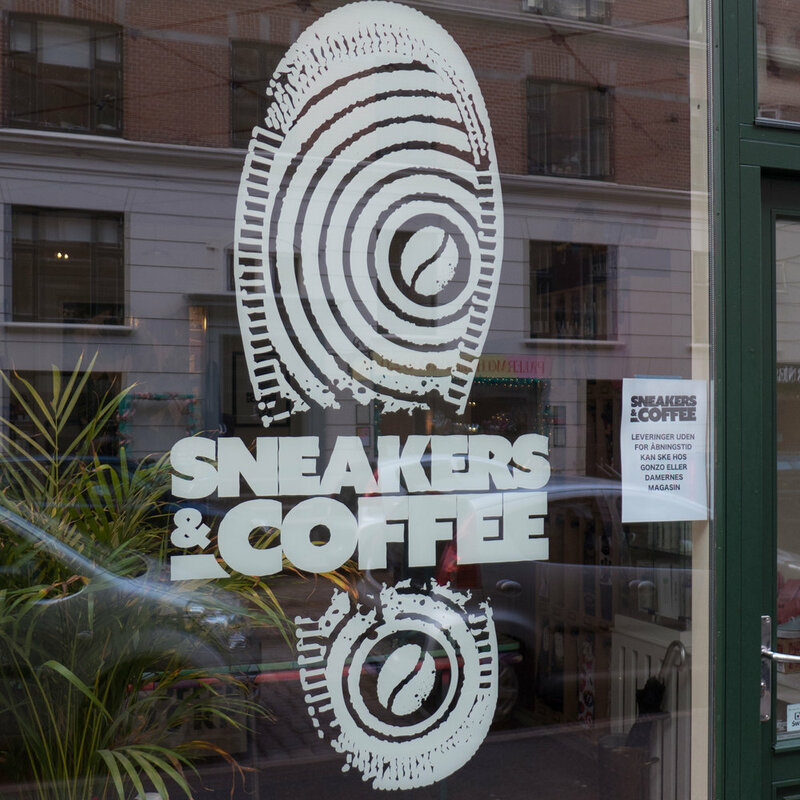 This is a space for walking, for looking and for sitting outside to eat and drink. There is an oddly placed Pissoir - at least tucked away but across the small side space of Kejsergade. There is a large stone water feature - Vandkunst - by the Danish sculptor Søren Geog Jensen with the date 1971. The main feature of the square is a large Plane tree at the narrow end protected by old iron railings. Benches are set around the tree to look outwards … Jan Gehl observes that people prefer to sit with their backs against something - protected and so they can look outwards at activity n the space even if they are not taking part. There are other benches around the square but generally set back against the front of buildings and the other main street furniture is simple modern street lights. When the square was first pedestrianised it was popular with students from the university nearby and some comments suggest it was sometimes too crowded for the size but is generally now quieter and is unusual in the city because there are no shops. Until the late 19th century, this part of the city was just outside the old defences - the banks and ditches that surrounded and protected the city - just outside the north gate and immediately to the west of the important road leading up to the gate. The road came through what is now Nørrebro and crossed the lakes before crossing the ditches of the defences. A large park immediately to the west of the square has part of these defensive ditches retained to form a large lake. When the defences and the gate were removed around 1870 this was still a main road into the city and as the city grew rapidly out to the north, with big apartment buildings, the square was left as an open space and was used as a market area - the Grønttorvet or vegetable and fruit market - for produce brought to the city for sale. 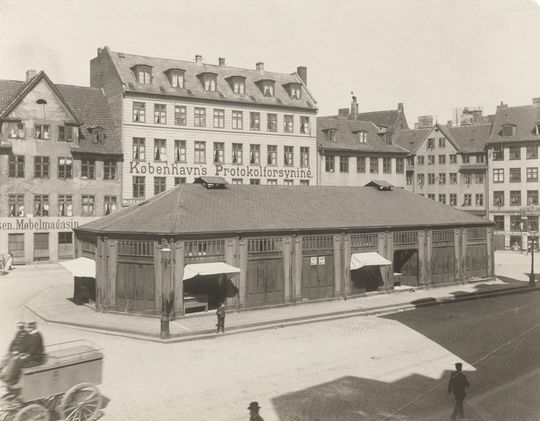 The market remained here until 1958 when a new wholesale vegetable and fruit market was built in Valby, out to the west of the city, and the square was then used as a huge car park. In 1973 an underground car park was constructed and football pitches were laid out on the square itself. I can remember coming to a flea market here on one of my first trips to Copenhagen. I can't remember if I bought anything but I do remember that several long rows of stalls set out along the east edge of the square hardly made an impression on the huge space and I remember that I came away with a thick coating of dust over my shoes. 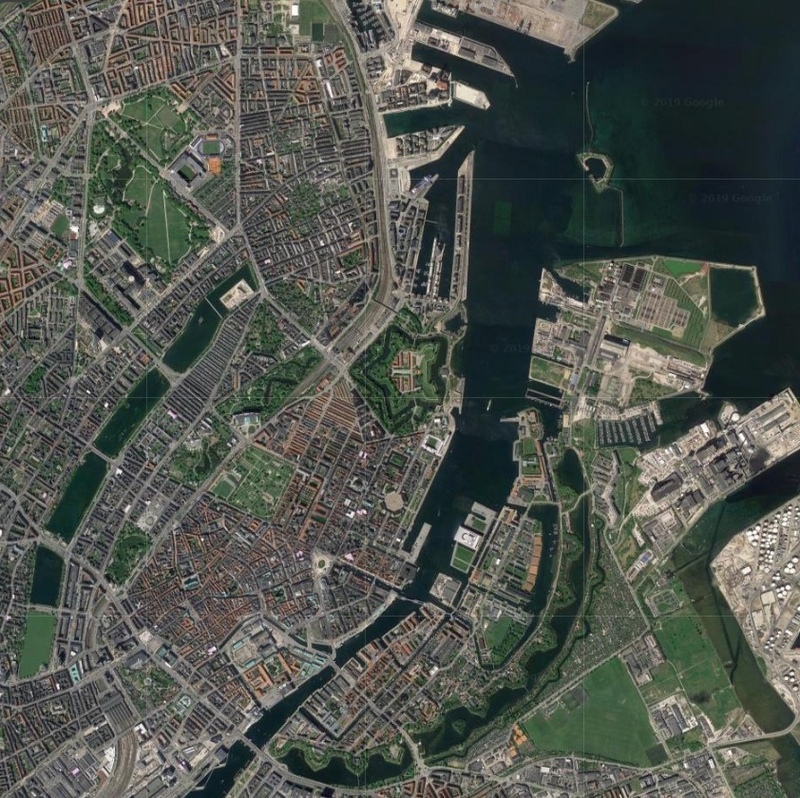 Over 260 metres long, this large space should really be seen as two distinct areas with Vendersgade between the two parts. The east half has two large food halls with the main road into the city - Frederiksborggade - across the east side and Ørestedsparken - a large and well-used public park - is at the west end. There are good apartment buildings along both long sides and including a church and a large and important school. All these buildings date from the last decades of the 19th century. The roads along both long sides of the space have some access to vehicles for deliveries but only Frederiksborggade has relatively heavy and continuous traffic including buses. Israels Plads itself is 150 metres long from Vendersgade to the edge of the park - Ørestedsparken - and 105 metres wide from Rømersgade across the north side of the square to Linnésgade across the south side from the facades of the buildings to the facades of the buildings opposite. These are good buildings, generally of four or five stories, and they define and enclose the space. The square itself is free of vehicles and the edge is raised with quite a high step that has a distinctive iron edging to prevent cars driving up even to park briefly. There is parking under the square for 1150 cars - the largest in the city - with the entrance for cars down a spiral ramp at the south-west corner and the exit by a ramp at the north-west corner but what is important is that traffic cannot drive across the west side of the square - across the access from the square to the park. Cars, driving into the car park, come from Nørre Voldgade and barely get into the square before they are taken down the ramp and cars leaving are directed away from the square immediately they leave the exit ramp to leave the area by Nørre Farimagsgade. There are four pedestrian access points for people leaving their cars or going back to retrieve their cars but these have open glass boxes with a relatively light structure over lifts and staircases and payment machines so these are barely obvious in such a large space. The key to the popularity and to the success of the space is that it is large enough to take very different events and activities, often at the same time, and yet there are few fixed uses, apart from the the sports area, so there is considerable flexibility … it is people who decide what they want to do here and not the space or the street furniture that dictates what they do. 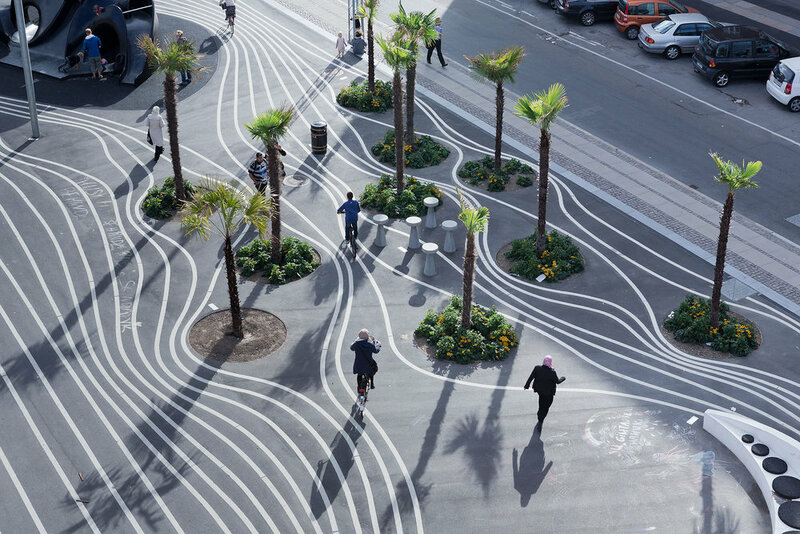 However, having said that, the space and the placing of street furniture is done with considerable care and subtlety to manipulates - to some extent - how people move through the space and certainly to direct where they look. There is a very clever use of diagonal lines so particularly the raised areas of steps across each corner lead you towards park at one end and out towards the food halls at the other. 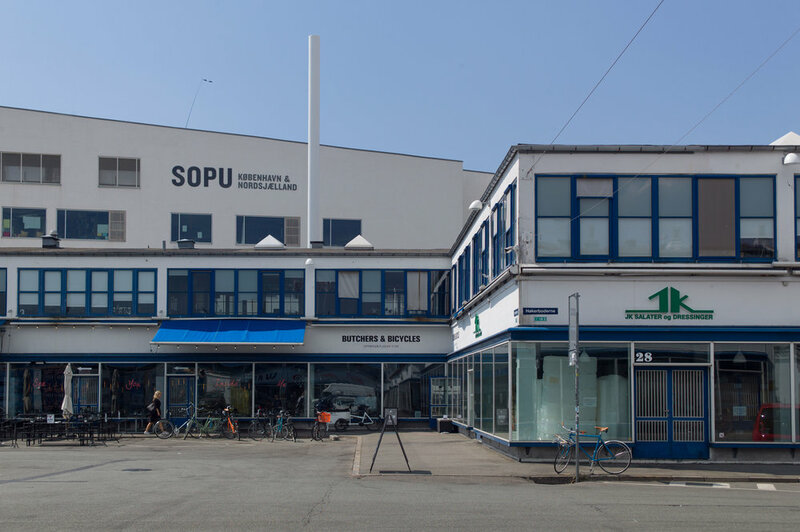 COBE was also responsible for the redesign of the large street-level space above Nørreport railway station - just one block away - but there the design was approached from the opposite direction. Nørreport is the busiest transport interchange in the city with a large bus station and with suburban trains, below ground, and the metro below that so COBE started by tracking how people moved across the space at ground level as they arrived at or left the station and fitted new buildings and areas for leaving bikes in the spaces where they walked least. 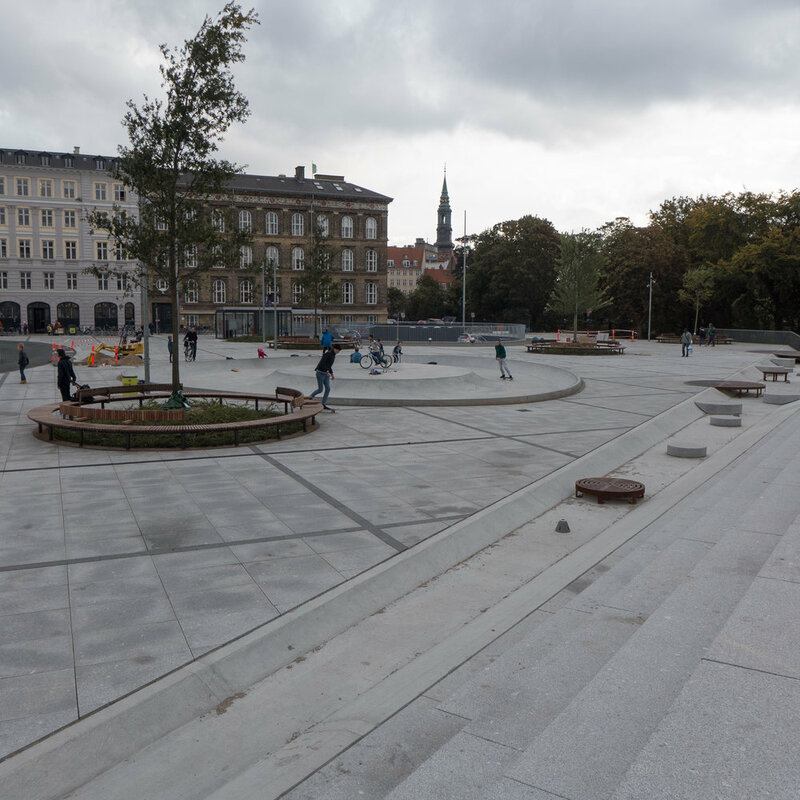 At Israels Plads it was an large open space - so almost a blank sheet of paper apart from the access points for the car park - and the design here is about placing street furniture to enhance and, in an almost subliminal way, control how people use and move through the space. Paving is laid out as a large grid, like giant sheet of graph paper across the whole area, with 16 large squares across and 25 along marked out by bands of darker stone or long, narrow drain covers and then, within each square, a regular layout of rectangular slabs. This pattern rises up the outside slopes of the large raised areas of steps across the two corners to bring these into the overall design but also to reduce their impact when seen from the side roads. The main features of the square and the street furniture are set in a series of circles of various sizes with the largest being for sport with two courts surrounded by a high fence although this fence itself is made a distinct feature by being arranged as a spiral climbing up from a main but narrow entrance point to keep footballs and so on in play. The surface of the sports area is sunk down slightly from the level of the main part of the square and there is an eccentric oval of soft surfacing that forms a bank around the sports courts where people sit to watch. A second main circle is a shallow bowl for skate boarders and then there are a series of circles framed by a flat rim of iron with circular seats and with single trees and low ground-cover planting. These circles are taken out into the space of the park and form what is almost a scalloped edge. Originally, there were railings that formed a distinct barrier between the square and the park but the road and the railings have been removed, across the end of the square, and the level of the square taken out as an apron, just beyond the line of the fence, to link together the two areas - park and square - and also to increase the impact of the change of levels from the square to the slope down to the lake in the park. Across the front of the steep bank of steps at the north-west corner is a stone rill or water feature that gets wider towards the park with a series of fountains and with iron circles forming a bridge across before the water drops down through a series of circular basins down the bank. The rill forms an effective division between the area where people sit on the steps across the angle of the corner to watch what is happening on the square. The rill keeps most skate borders to the square itself but also acts as a strong visual element, running at an angle, that leads people towards the centre of the west side and to the series of ramps down into the park. The effect is that trees from the well-planted and well-established park seem to come up into the space of the square so depending on the direction you are walking you move from the busy city space at the metro end, through the bustle of the first part of the square and through the busy food markets to the area for sport and exercise and areas for people to sit and watch what is going on and then on to where the trees become larger and you enter a transition point where you come to grass but with an iron-covered edge so you step into the park and then down a steep bank, down gravel paths, to the lake. The other way round, of course, if you start at the lake, you are well below the square and hardly aware of what is happening there but as you climb up and enter the square you move into a more and more urban and more and more busy city space. Torvehallerne was opened in 2011 and is now a very popular destination - not just for tourists but for local people and for people, heading home from work in the evening, who stop here for a drink or an early-evening meal. The two food halls are large - each 50 metres long and 24 metres wide - and are set parallel some 21 metres apart so there are food stalls and market stalls outside in the space between the two halls. They are set back from Vendersgade, the road that divides the two parts of the square, but there is much more space at the east end where the halls are set back from Frederiksborggade to form a square. This is important because it separates out and differentiates different functions so the large space, at the far end away from Israels Plads, has outdoor eating and is busy with lots of people here well into the evening and it has a distinct city feel … there is an entry to the metro just outside the square towards Nørreport. 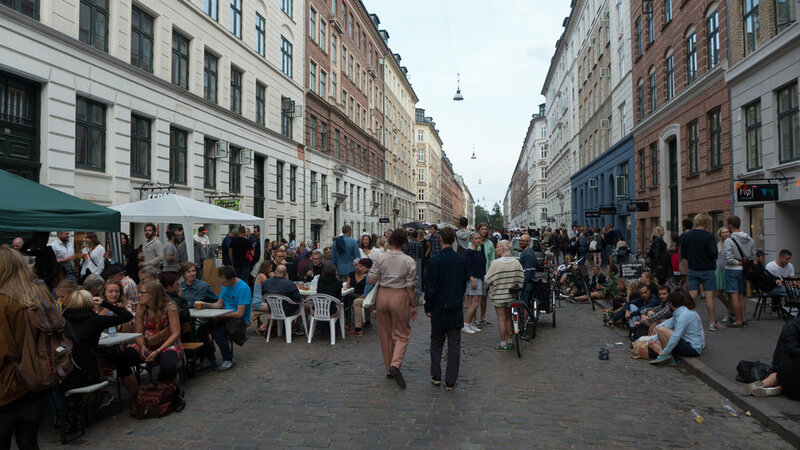 At the west end people sit immediately outside the food halls, out in the sun, to have a coffee or they cross the road to the main part of Israels Plads to eat snacks or drink while they sit and watch what is happening on the square. Copenhagen has a number of linear parks of which the most ambitious is Superkilen in the district of Nørrebro just to the north of the city centre. The north section of the park forms a green wedge down from Tagensvej - a major road - and continues through to Nørrebrogade and then, across that main shopping street, the series of parks runs on to link with Nørrebroparken. Superkilen or Super Wedge follows the route of an old railway that cut through the district which explains the long narrow site with much of it behind buildings. There is a mixture of architecture, including some good industrial buildings that have been adapted to new uses, and some apartment buildings look down on the space but, unlike a square or street, it is not enclosed or defined by building facades. In strict architectural terms, the shape of the park seems odd and irregular with space leaking out so the opposite of Skydebanehaven or Shooting Gallery Park in the city that is enclosed by housing so that it is almost like a secret garden or secret playground owned by the community. However, at Superkilen, if space leaks out, that means that the opposite or reverse is true, so spaces run into the park to draw local people in to make it a strong and important part of everyday life in the neighbourhood. This area that has seen a number of public disturbances for a number of different reasons but having written about the recent publication of a new government policy for ghettoes in Denmark it seemed important to highlight the rejuvenation of this public space as a deliberate and very positive intervention by planners for social reasons. Work started in 2010 and the park was completed in 2012. The team behind the design and its realisation was BIG, the architectural firm of Bjarke Ingels, with Toptek 1 and the Superflex group. 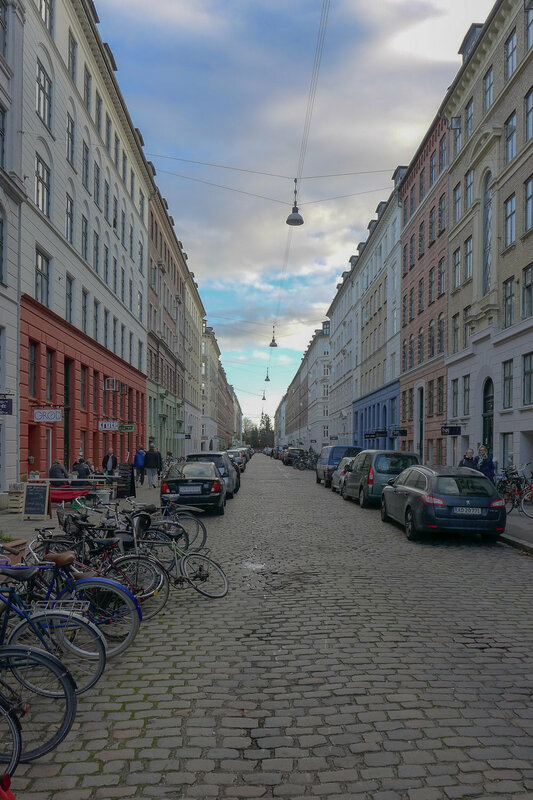 The park is 750 metres long and runs north from the main shopping street of Nørrebrogade with the entrance to the area just to the east of the railway station at Nørrebro, and it continues up to Tagensvej with just one road, Mimersgade, cutting across about a third of the way along. This is a local road and a clear and open crossing seems to work well with cars slowing down or stopping to respect cyclists and families going from one part of the park to the next. At the south end, at the shopping street, the park is 85 metres wide, so open and inviting people in, but at parts it narrows down to 25 metres so there is a sense of spaces opening out and closing in so, deliberately, this is as far as possible from the idea of a regular and formal avenue. There are three distinct sections to Superkilen. The first, immediately north of the shopping street, is the Red Square with a distinctive red surface just replaced with red brick paving. On one side is Nørrebrohallen - now a major sport facility - so this part of the park is used for team sports and activities. 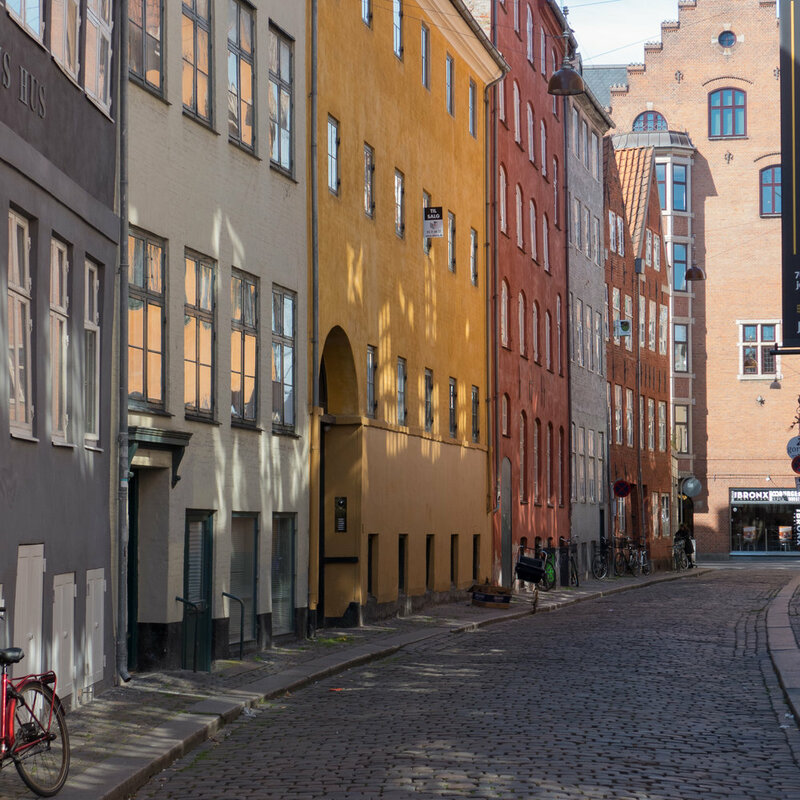 Just over Mimersgade, is Black Market with closely set but wavering and twisting lanes that are marked out with white lines, and then, beyond that, the largest area is a green park. The cycle route runs with sweeping curves along the full length but footpaths, in some parts flanking the cycle route and in others breaking away, are deliberately less rigid to encourage people to move from one area to the next. Perhaps the most distinctive feature of the park, and what has contributed to its fame, is the play equipment that varies from tables and seats marked out with board games to exercise equipment. This is an area with immigrant families who have come from a very wide range of countries and the community was consulted so fixed features and seating - some 108 features in all - reflect the ethnic diversity with designs inspired by things in home countries or physically sought out and imported to be set up here. These range from manhole covers from Zanzibar to a Donut sign from Rochester, Pennsylvania and a Monkey-puzzle tree from Chile. Some of the features are for activity so climbing and areas to run and climb for kids (of all ages) who may be living in small and cramped apartments. There is much here that encourages people to stay and interact with other people in the community so there is are various seats, tables with board games, fixed barbecues for cooking a meal outside and a band stand and the success of this is clear as the area is well used. There are community facilities along or close to the park and it is hardly surprising that art and design companies have been attracted to the area: JAJA Architects ** and Tredje Natur are here and their trial for climate-change paving at Heimdalsgade is just off the park on the east side in front of a popular café. With the ongoing development of the north harbour and the large new island that is planned to, in effect, link Nordhavn with Refshaleøen, it is too easy to think that claiming large areas of new land from the sea for building is a modern phenomenon achieved with modern engineering and modern technology but, of course, in reality, the city has been building out into the sea for over 400 years. If you are standing on Gammel Strand now, then you are right in the centre of the built up city but if you had stood there at the end of the 16th century you would have looked across a wide area of open water to the low-lying island of Amager about 2 kilometres away and with just a few islands between including the island with the royal castle standing just off the shore. Even back then Gammel Strand was hardly on rock-solid ground as wharves and warehouses had been built out from the shore as the importance of the port meant more and bigger ships trading here but it was Christian IV who deliberately and with foresight developed the naval dock and used Dutch engineers to set out and construct a series of canals and islands for a new town for merchants that is still at the heart of Christianshavn. Initially, naval docks were developed on either side of the castle with warehousing for supplies and shipyards and rope works. Christianshavn was protected across its east and south sides by high banks and a defended gate to get to and from Amager - in case armies landed on the island and attack the city from the south - but the main development of the harbour came in the middle and the late 17th century when these defences were extended in a great arc eastwards and north to provided sheltered and defended moorings for the naval fleet … a segment shaped area that is over 1.5 kilometres from, Christianshavn to the entrance to the harbour at Nyholm, and, at the widest point, almost a kilometre across. Through the 18th and 19th centuries more and more islands were constructed within this area leaving canals and areas of open water so that naval stores, shipyards, barracks and so on could be moved out from the area around the castle. With all this major work, commercial merchant shipping also moved out from the centre both north, eventually as far out as the Free Harbour opened in 1904, but also south with new wharves built out from Islands Brygge that remained busy until the 1960s. The last stage of the development, in terms of claiming land from the sea, was as recent as the 1950s with the development of Refshaleøen and its ship yards beyond the naval area and later again, at the north edge of Amager, oil facilities and waste and sewage and water treatment works. If you are looking at the source of the wealth and the political and economic strength of the city, and therefore, to some extent, the country, then the greatest single resource, over half a millennium, has been relatively shallow and relatively sheltered coastal waters where it has been possible to construct artificial islands so the city can expand and prosper. That is precisely why any future development out into the sea has to be debated and considered and questioned because it is an exceptionally important resource and like so much else it is running out … or at least the areas close to the city has been exploited. New islands will be more of a challenge, will demand more infrastructure - as they are further from the centre - and will have at least some impact on the character of the city as it is now. In Danmarks hovedstad Initiativer til styrkelse af hovestadsrådet / Denmark's capital city Initiatives to strengthen the metropolitan area - a government report published in January 2019 - it was suggested that there could be housing on Nyholm but surely the island is too important to be relegated to an expensive development plot unless perhaps new buildings are linked back to the navy so, for instance, for a naval hospital or naval retirement home. Intensive development on Amager and at the South Harbour was justified because releasing land there for dense housing developments was lucrative for the port and city authority and money raised was used directly to finance the construction of the Metro. 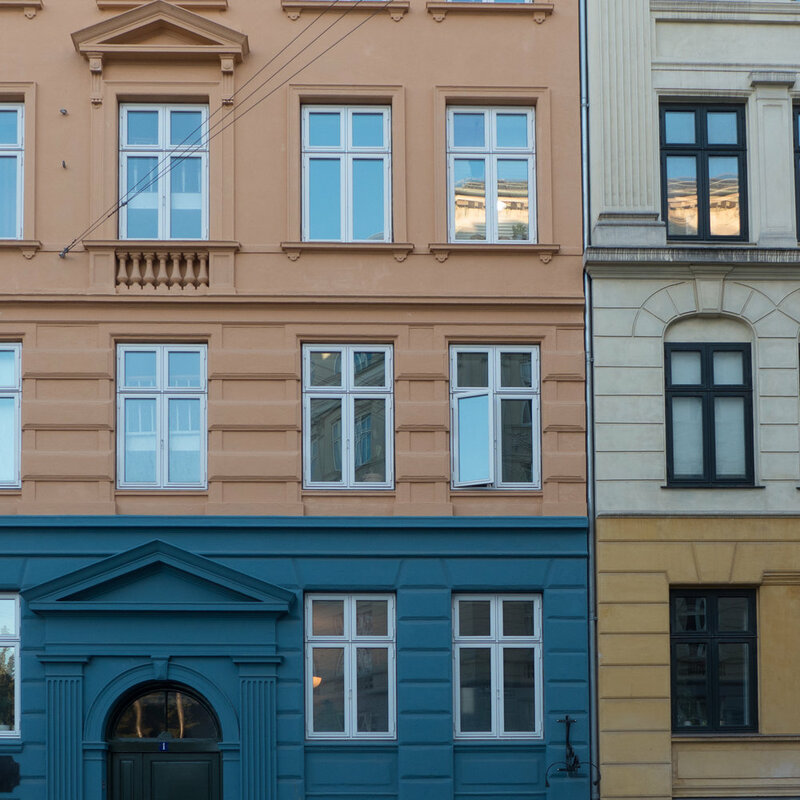 There is no such financial imperative for Nyholm and very expensive and, presumably, very exclusive apartment buildings should surely not be the immediate go-to solution for any and every planning scheme in the city. 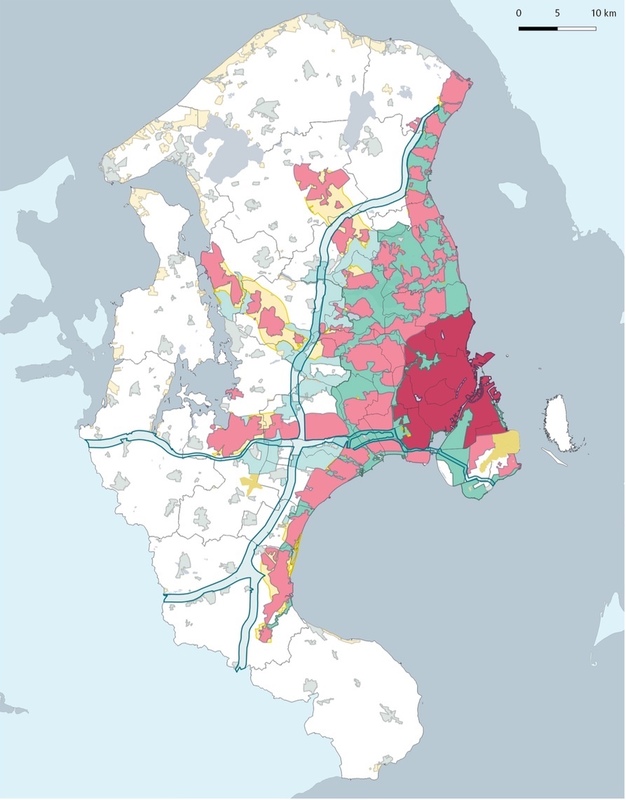 This was a difficult post to write because it is about sensitive political and social issues but the subject is important and not least because there very specific implications for planning and housing in Denmark that will influence future policies for planning and should have a much wider relevance and for many if not most countries. 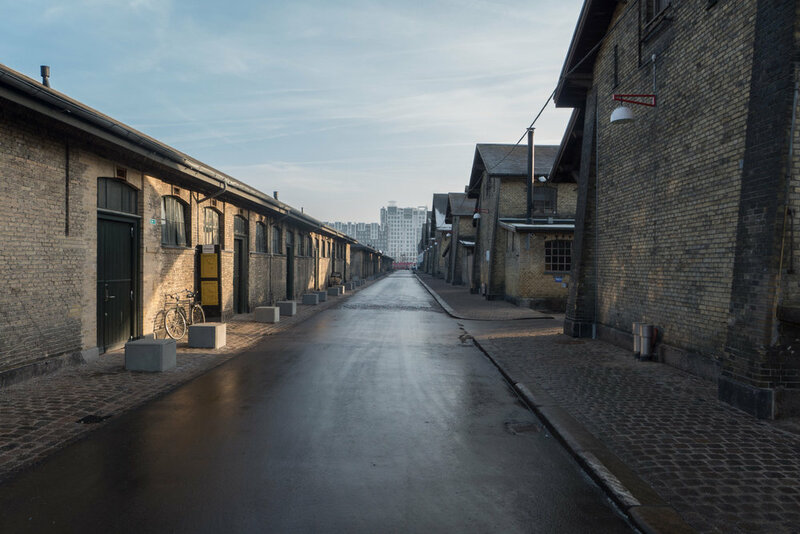 In the New Year the government published a report - Ét Danmark uden parallelsamfund / One Denmark without a parallel society - that sets out a policy to tackle problems in some urban areas in Denmark that will now be defined officially as ghettoes. My immediate image of a ghetto - the picture conjured up by that word - is of crowded and poorly-built and or badly-kept buildings that are occupied by people kept there by poverty, isolated from wider society and from wealthier neighbourhoods, often nearby - so slum housing - so people, for different reasons, trapped and living with high levels of deprivation. Here, obviously, I have to admit that I have had a relatively privileged and very middle-class life growing up in a very beautiful university town and then in well-designed modern housing in a new town. When I went away to university I went to Manchester to study art history - you can hardly get more middle class - and I loved the grandeur of the Victorian city and lived initially in what had been, in the 19th century, a private gated street of large villas. But that was just two blocks away from Moss Side … then defined officially as being the worst slums in Europe. Worse than Naples or Marseilles or Glasgow. Recently I came across some images of the slums in Moss Side and other parts of Manchester taken by Nick Hedges - a photo journalist - at exactly the time I lived nearby and I was truly shocked because it made me realise that time has blunted my memory of just how grim that area was and my memory had blotted out what was the reality of life for many people who lived there less than fifty years ago. Since then I have driven through Soweto, seen Baltimore and travelled through much of South America so I am not naïve about the reality of poverty and deprivation - just naïve about how you deal with it. I feel strongly that anyone and everyone visiting New York should go to the Tenement Museum and people should look at photographs of slum housing in London in the 1930s and in the 1950s and 1960s for a realistic context to understand just how recently that sort of housing was a reality in what are now very wealthy cities. There is a tendency in the affluent west to be blind to just how recently that sort of poverty and that sort of housing existed in their own countries. In Denmark the definition, by the current government, of specific housing or distinct areas as ghettoes does not, in fact, stem from or define that extreme sort of housing but is about what problems that have developed as people migrate to Denmark but want, as most humans do, to be with people who have a common background and often a common language. Many Danes are aware that, in the worst situations, this can lead to isolation of communities and then on to a cycle of relative poverty and problems with education and employment that can trap people. And when people are trapped they do not benefit, as much as they should, from being an integrated part of Danish society. There is a growing concern that being isolated really does increase social problems - particularly for boys and young adults, and their membership of gangs - and it is that isolation that is described as living in a parallel society. It is difficult because visitors - and presumably many migrants - coming to Denmark see affluence and see tolerance and see a freedom of life with enviable choices and then make the assumption that that was and is an easily achieved privilege. Actually, it has to be remembered that for older Danes, many can remember the slum housing in Vesterbro - as bad as anything in Manchester - or the slums that were cleared away in the 1950s from the area around Borgergade - not far north of the royal palace - and they know that their high quality of life now has been achieved through social and political changes and not simply dished out. 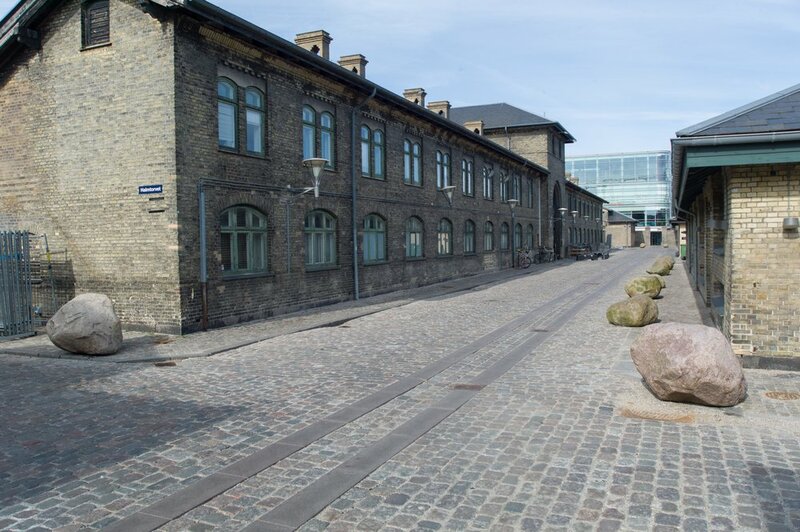 I cannot recommend enough a visit to Arbejdermuseet - the Workers' Museum in Rømersgade - to find out more about working conditions and living conditions for many families in Copenhagen through the 19th and 20th centuries. Of course the problem for migrants, in search of a better life but finding themselves isolated and trapped, is not just a problem in Scandinavia or for the affluent west but is a global problem and not just about the equitable distribution of opportunity and resources but how you can expect people to be taunted by affluence through advertising and merchandise sold to them, but remain content with what they do or, more often, don’t have. And, of course, the problems tend to be seen as the consequence of migration from one country or one continent to another but is just as relevant with mass movements of people from rural to urban areas within a single country. This is really about managing expectations and managing numbers. In Denmark, twenty-two initiatives have been set out by the government for urban areas that have problems seen to come from people living in a community that, for many different reasons, are isolated and parallel communities. Funding will now be available for demolishing some housing and for improving some areas but also there will be measures targeted at education with a focus on vulnerable children. Sixteen ‘ghettoes’ have been identified and substantial amounts of funding have been allocated to make the changes set out in the report. Much of the programme to deal with these ghettoes is about social housing and about the stock of older housing - some from the 1920s and 1930s but also from the post-war period - so housing that would not be built in that way now … and it's about learning lessons and about trying to prevent more problems down the line through intervention now through education and through focused urban planning. Danskerne i det byggede miljø / Danes in the built environment is a detailed annual survey that asks Danes about their homes. 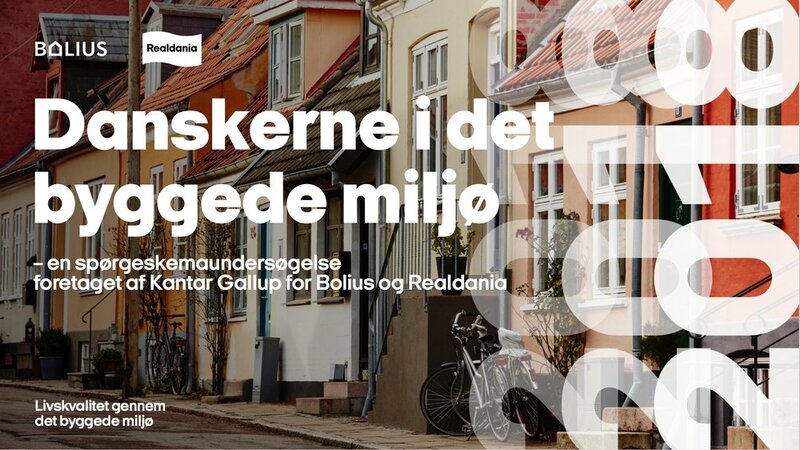 Information for the most recent report was gathered in April 2018 when 7,090 people completed a questionnaire from Kantar Gallup A/S for Bolius. The results have been published by Realdania and the most recent edition is now available on line. These surveys have been conducted each year since 2012 so they now provide an important data base but they also track changing attitudes so they should influence decisions by planners and should prompt architects, builders and designers to assess carefully the real problems people encounter because the surveys show how people perceive problems and show how these are prioritised. The survey is published with general points and summaries but most of the information is set out in a large number of tables. These provide a fascinating insight not just into day-to-day practical problems people have and about the way they complete maintenance and repairs but also broader issues about neighbourhoods - about what makes a good neighbourhood - and how all these factors together influence how people rate the quality of their lives. 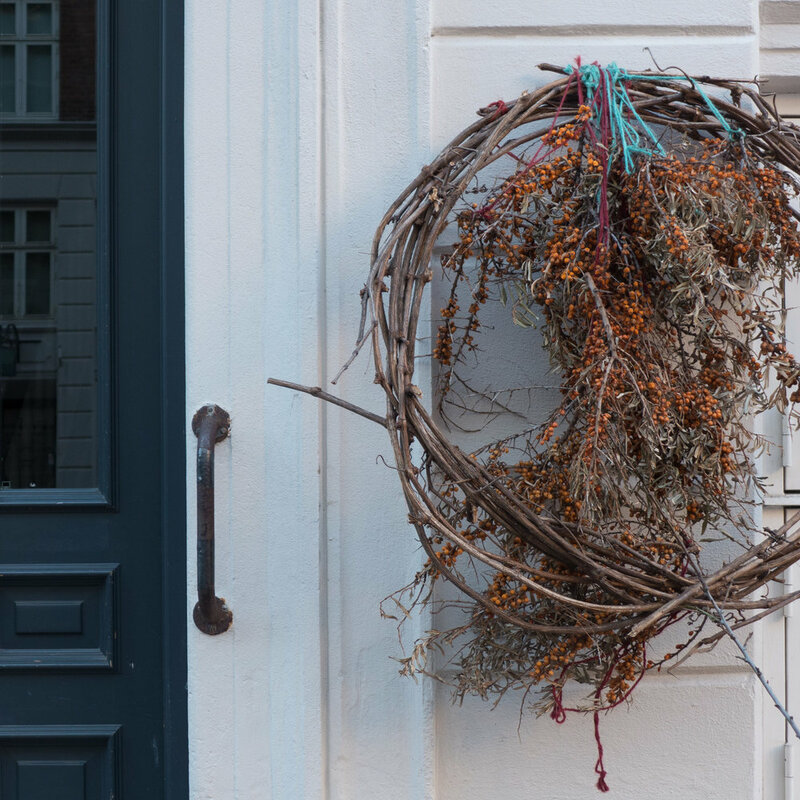 More than 6 out of 10 Danes believe that their home is important when they consider the quality of their life … for 22% of Danes their home is of very high importance and for a further 41% their home is of high importance when they consider the quality of their lives. It is interesting that large numbers are concerned about problems with general maintenance - in fact around 90% - and least concerned about problems with buying or selling a home. Danes are concerned most about mould and about burglary … and more in Northern Jutland than in other parts of Denmark. To this should be added that tenants are also concerned about rising rents so, from the most recent survey, over 50% of tenants are concerned about rising rents; 30% are concerned about mould and a similar percentage are concerned about a bad neighbourhood. Further down the list are concerns about bad neighbours and lower still problems with hidden electrics and hidden piping. There also seem to be major concerns about what is described in the survey as poor indoor climate - so ventilation and, as a consequence, mould or fungi and, along with problems with poor neighbours, these concerns are more significant for families with children. On first looking through the tables there appear to be some strange contradictions so seven out of 10 Danes are satisfied with their neighbours and their neighbourhood but, on the other hand, every third Dane admits that they hardly know or don't know their neighbours. To be more positive, one in five have street parties or garden or courtyard parties with their neighbours. Even in terms of social life in a neighbourhood, there are some interesting differences, depending on the type of home, so 20% of Danes who own their home actually invite neighbours for a meal but in a housing co-operative - where being sociable might be considered to be more important - only 15% invite their neighbours round for a meal although that is better than where people are renting and only 10% invite their neighbours for a meal. Generally, older Danes say that they are satisfied with their neighbourhood. Does that mark a change over generations - with younger people having less connection with the place where they live or different priorities and a different focus for social life - or does it suggest that feeling settled in a neighbourhood takes longer than might be assumed? There is a fairly uniform satisfaction across all levels of education and nor does income have a clear connection with good neighbourliness. It is interesting that the people most dissatisfied with their neighbours and their neighbourhoods are those with the highest and the lowest household incomes. 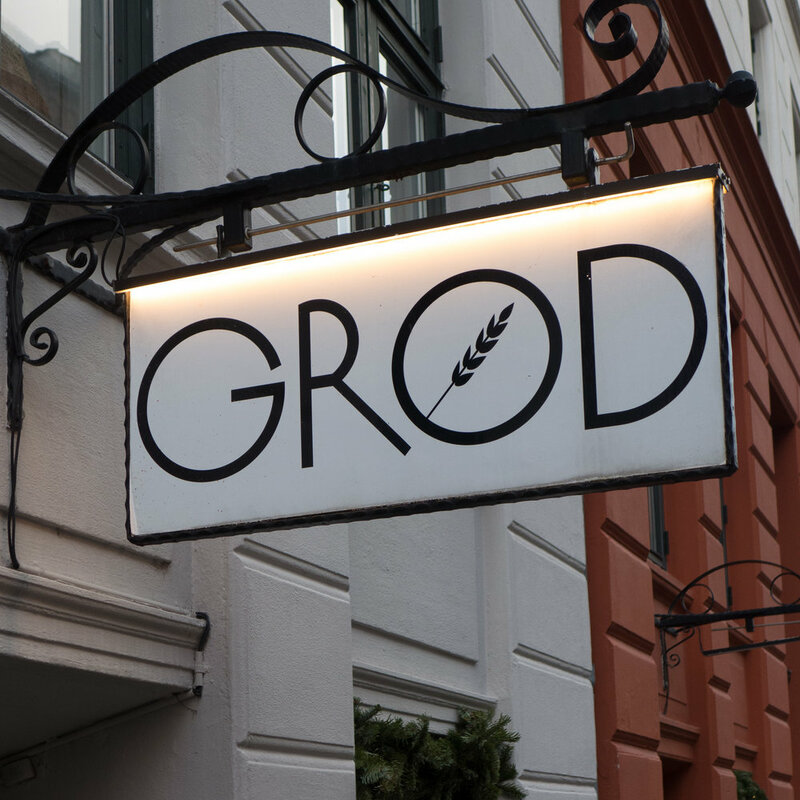 People in the survey indicated that a better choice of shops is important for 18% of Danes - as an average across the survey - but it varied across the country with 24% in rural areas but less, so around 15%, in the city and across the whole survey 16% think restaurants are important so relatively high in general priorities. In comparison only 6% see better broad band as a priority (10% in rural area and 5% in cities) but this might simply reflect a general satisfaction for present services that seem to be relatively good. In the same way, better schools are a priority for just 4% and better day care for 1.5% but this, presumably, does not suggest that education is well down the list of priorities because Danes do not care about schools and day care but must reflect tangible and clear improvements over recent decades so now, generally across the country, the provision of day care and nursery and then schools is of a high quality and so no longer a major concern. Although "proximity to nature" is given frequently as an explanation for a choice of home, only every sixth Danes make use of nature or natural areas on a daily basis, and only 40% seek out nature at least once a week. Again it is probably not surprising that the region of Southern Denmark has the largest share of citizens who use outdoor areas in their neighbourhood most frequently. In apartments people seem to have higher levels of concern over most categories … 30% are concerned about ventilation and cold, 25% complained about cold walls and 15% about moisture and mould and curiously 8% are concerned about being too hot while 10% are concerned about too little or too much daylight in their home. In more general questions, people living in older homes, as you might expect, tend to be concerned about cold and people in properties built after 2000 tend to be concerned more about being too warm and occupants of modern homes also tend to be more concerned about air quality. For homes built before 1930, 24% are concerned about cold walls but for homes built after 2000 that has dropped to just over 4%. Conversely, feeling too hot in their home was the concern of 5% in homes built before 1930 but 14% in modern home so presumably that suggests modern insulation is good but it is difficult to get the balance right. Possibly, local or district heating systems are not as easy to control but it is interesting that older people opened doors and windows most often to improve ventilation. For admirers of the Danish concept of hygge, perhaps the most worrying statistic suggests that 12% of Danish households have cut down on using hearths, stoves and candles because they are concerned about air quality. There are some marked differences by age so it is obvious that younger people tend to consult the internet rather than family or friends about maintenance problems but, across the age ranges, the use of craftsmen to do work has declined from 67% in 2014 to 60% in 2018 so, presumably, DIY in Denmark is on the increase. If all this seems to suggest that Danes fret about their homes then across the survey, on a score of 1 to 10, general levels of satisfaction with the quality of homes ranged from 6.7 to 8.2. Finally there were some general statistics that should interest designers and builders because only 21% of the participants in the survey indicated that they felt that maintenance or building work should make the home more up to date and, overall since the surveys began, there had been a decline in number of people undertaking major refurbishments. Perhaps Danes are less concerned about fashion than magazines and blogs might suggest and rather more concerned about very practical aspects of comfort. In the UK there is considerable concern about the decline of high streets or main shopping streets in many towns where an increasing proportion of shops are empty or now used by the charity sector but this does not seem to be as obvious a problem in the major Danish cities … in Copenhagen businesses come and go but there are few abandoned shops. 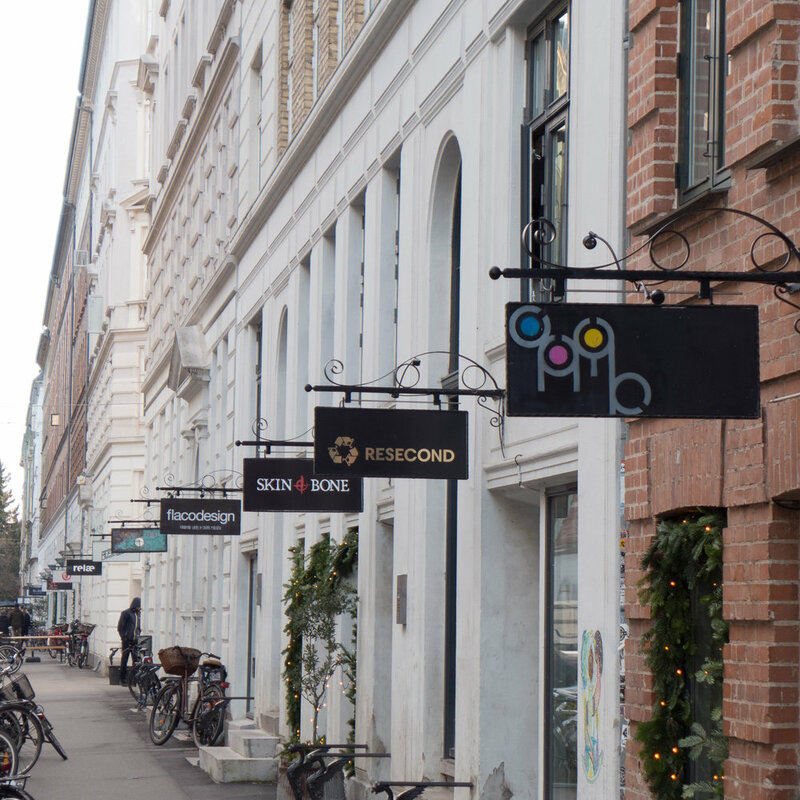 The success of Jægersborggade as a shopping street suggests clear reasons for the difference between the two countries. 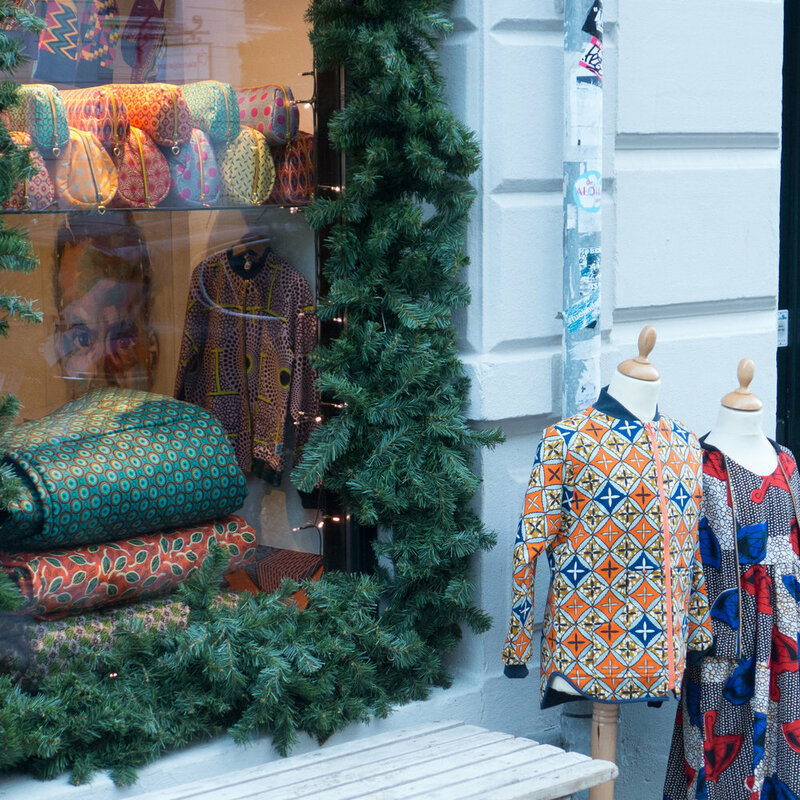 Most of the shops are independent but generally, throughout Denmark, there seem to be more small independent companies and local brands so if one fails or moves on to another building then the impact is not as obvious. In the UK, even in small towns there are more national or at least large-scale regional brands so if a retail company fails then that has a wider and obvious impact. Having lived in Denmark for nearly five years it also appears to me that the pattern of shopping is different. In Copenhagen there is a large shopping area in the centre of the city with three long streets of shops, two of which are pedestrianised, and with department stores and international brands along with Danish companies but there is also a strong tradition in the city of shopping in each area or district … so buying food on the journey to or more probably on the journey back from work but also there is regular use of shops and cafes in the afternoon when parents pick up children from school. Jægersborggade is very popular at weekends but with a large number of cafes and small restaurants it is also lively in the evening but even during the day it is rarely quiet. It's said that location is everything. Jægersborggade is just over 2 kilometres out from the centre of the city … far enough out to have it's own identity and far enough but not too far so it is also a nice destination - a short walk or a short bike ride for a morning or an afternoon. 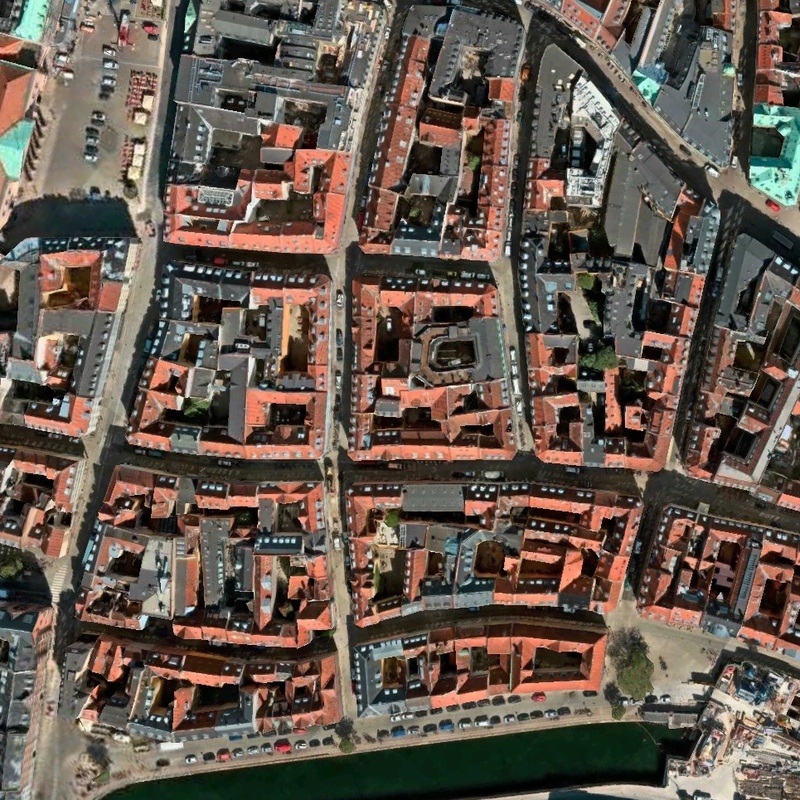 As in so many cities, in Copenhagen main roads radiate out from the centre. Jægersborggade is between and runs parallel to two of these main roads with Nørrebogade less than 500 metres to the east and Ågade just over 500 metres to the west. This is important in that Jægersborggade is not on a main traffic route but also, although the shops are - how to put this in socially aware Denmark - more middle class and more expensive, this is in part possible because for all the people living in the apartment buildings along the street and nearby, this is not their only shopping street … there is a launderette but apart from that the street can have more expensive and more specialist shops because supermarkets and so on are near on main roads just three or four blocks away. More important, Jægersborggade is not actually a through road or a cut through for traffic … at the city end is a main cross street Jagtvej which is a relatively busy section of an inner ring road but Jægersborggade is one way, with traffic only allowed to drive in the direction of the city so there are no cars turning in from the main road and at the end furthest away from the city is a park. The street is 330 metres long and around 14 metres or about 45 ft wide and with buildings of six storeys along each side it has a distinctly urban feel but it is narrow enough so you can see across to what is happening on the other side and cross backwards and forwards without having to worry too much about moving traffic. Cars parked on both sides is not ideal but the pavements are relatively wide - not far off four metres - so there is space for people to stop and window shop without blocking the path and many of the cafés have seats and tables outside. This part of the city dates from around 1900 and it is a street of traditional apartment buildings so above each shop there are five or six relatively large and now highly sought-after apartments. Most of these buildings are also of the traditional form with the apartment buildings built with a central doorway from the street leading to a lobby and central staircase with an apartment on each side at each landing. That means that the street has a large number of people actually living here and they come and go through the front doors so the street feels occupied and busy. It is difficult to be certain without looking through historic plans and photographs but many of the shops appear to have been shops from the start although some of the ground-floor spaces are still bike stores and service rooms for the apartments. All these ground-floor spaces are relatively low and are actually down from the street level so there are two or three steps down into the shops. In many parts of the city there are more steps, sometimes a steep flight of six or seven steps, so there the commercial spaces are half below ground and half above. This is a distinct Copenhagen form of apartment building and, curiously, that also contributes to its current success as a shopping street. The shop units are narrow - some frontages little more than 4 metres wide with just a doorway from the street and a single narrow window - most just two rooms deep and are relatively low so they are ideal for a small business but not so good for a national or international company that so often has clear prescriptions for size, appearance and arrangement for retail units in their global brands. The architecture is typical of the period with strong features including heavy rustication of some lower levels, classical style architraves around doors and windows, strong emphasis on windows to staircases and cornices and plat bands. This has been enhanced with strong and bold colours and there is good control and good design for shop signs. Some shops have modern plastic-framed windows and doors but a good number retain original fittings. Developers in 1900 acquired plots so there are various styles along the street and many of the apartment buildings were built in pairs creating an interesting vertical rhythm so the pattern will be shop with apartments above, steps up to door with staircase, shop with apartments, shop with apartments, step up to door with staircase, shop with apartments above. The street is also interesting because it is not long continuous rows on both sides … on the west side there are a number of short, narrow, pedestrian cross streets running through to the parallel road and on the east side - opposite these cross streets - short open courtyards running back into the block. With so many apartments and so many sought-after apartments, this is a family-friendly area so not just a street for young, single, affluent professionals to come to from elsewhere in the city but many young families live in the street or in adjoining streets. There are good small local schools and at the end of the street away from the city is Nørrebroparken with superb play equipment so this is a dynamic residential area. Athe other end of the street to the park, at the city end of the street, and just across Jagtvej, is Assistens Kirkegård, a large and famous city cemetery - Hans Christian Andersen and Søren Kierkegaard are buried here. Now to English readers it will seem perverse or even downright weird to suggest that a shopping street could be popular and successful because it is close to a cemetery but in Copenhagen cemeteries are well kept and important and very beautiful public spaces with mature trees, grass areas and pathways where people walk and sit on benches and appreciate the trees and the plants and some even look at the memorials. If you walk or even if you are on a bike and come from the city centre then you can come straight up the broad central avenue of the cemetery and at the top are large gates, and then pedestrian crossings to left and right to get over Jagtvej and there, facing you, on the other side is the start of Jægersborggade. 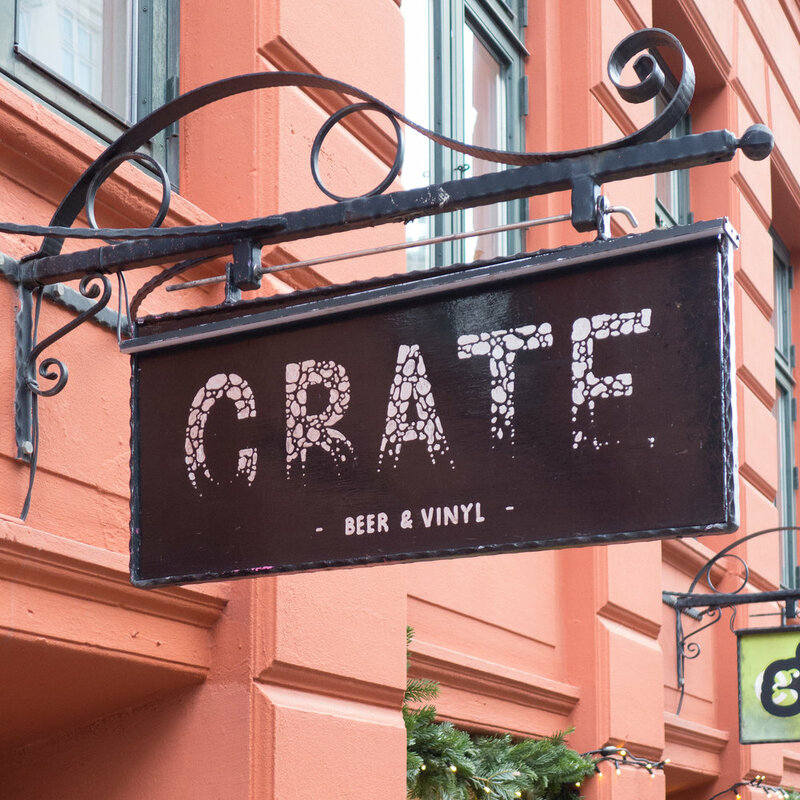 Believe me, it makes for a pleasant afternoon to saunter through the grave yard, walk up and down the street, have a coffee at one of the places with tables outside - to watch the world, or at least a good chunk of Copenhagen life, walk past - or maybe have a beer at the bar of Mikkeller & Friends just round the corner . There are serious points to be made here about planning for shopping in the city. And there are more. 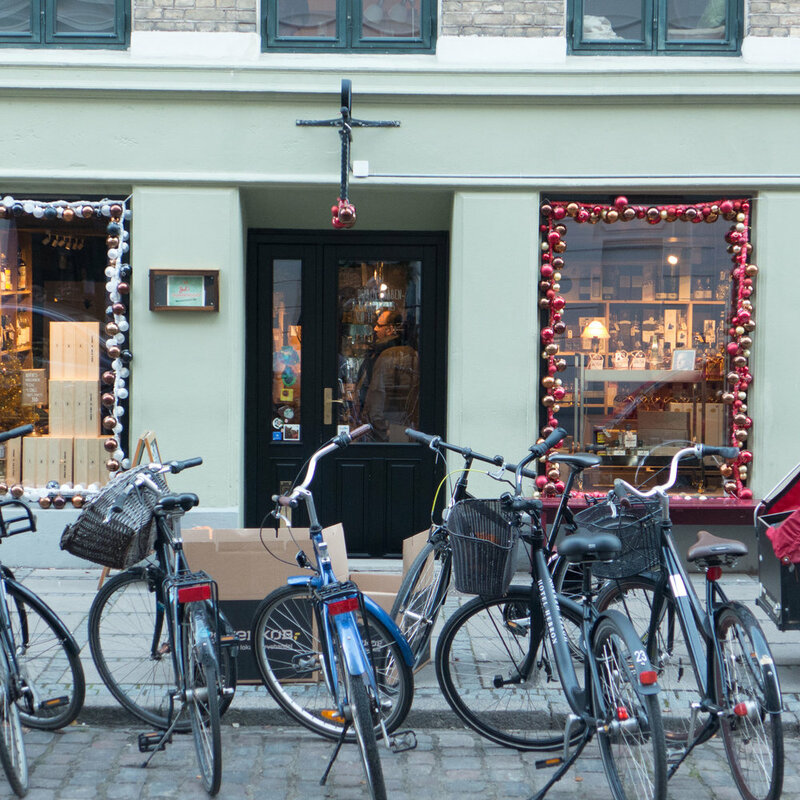 This is not simply saying how wonderful Copenhagen is - although obviously it is - but the point here is that all round the city there are small local shopping streets that are lively and extremely pleasant. In part that is because the city planners have a policy that no area should drop behind, in terms of public facilities or quality of hard landscaping or public transport. 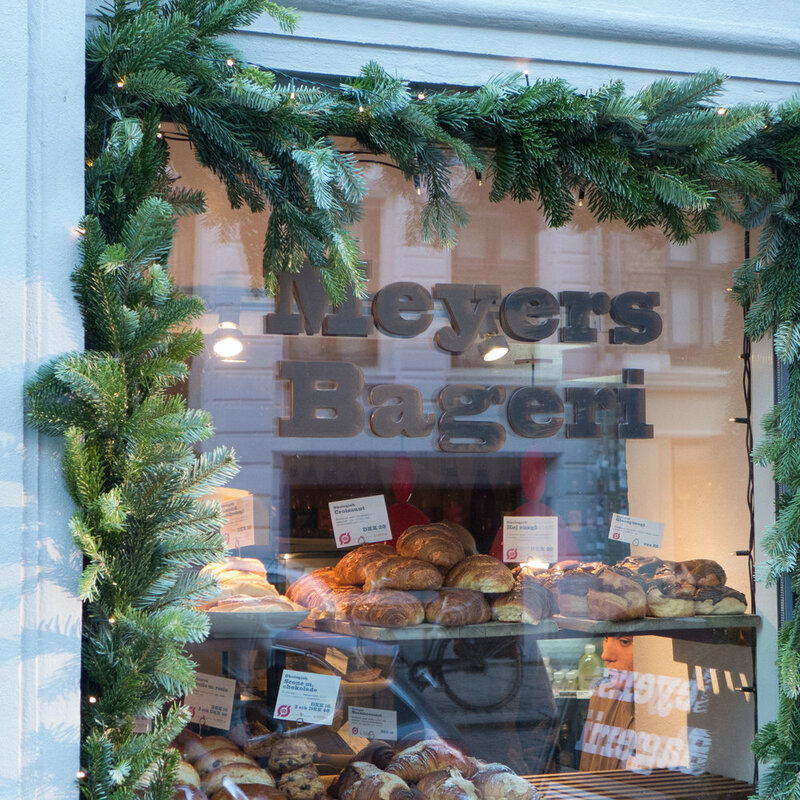 If there was just Jægersborggade it would quickly become swamped by it's own success so the aim has to be to get a well-spread patchwork of traditional shopping with supermarkets and so on and then, nearby, destination streets of specialist shops with places to eat and have coffee. Of course, there are critics of all this in the city because it is clearly a form of gentrification and older residents in older working-class areas do feel that their housing, because it was cheaper than housing in existing more middle-class districts, is being colonised and some do feel they are being driven out by relatively young families and, ok, relatively affluent and relatively trendy professionals even if it brings life and businesses to the area. This is what is now by some called placemaking and it is difficult for planners to get the balance right. For a start planners cannot vet who takes on the lease for a shop although there are controls on certain types of use. These are also changes driven by social factors that cannot be controlled by planners … significant changes to how and when and why people shop. This change in shopping patterns was identified by Joseph Pine and James Gilmore around 20 years ago in an article Welcome to the Experience Economy in the Harvard Business Review where they talked about an evolution from shopping for consumer goods that was changing to people wanting an increasing number of services in shopping areas, from advice to learning and health, and that moving towards a search for 'experiences' so for the high street or shopping area people want opportunities for fitness, entertainment and eating out. They talk about staging experiences that sell and that would certainly be one way of looking at the success of Jægersborggade. Curiously, as a final thought, shopping centres - of the covered indoor arcade type - further out of the town centre - usually with parking for cars to draw in people - are still popular and successful in Copenhagen although it is interesting to see that one of the older shopping centres - Fisketorvet - that opened in the south harbour area in 2000 is about to be extensively remodelled. It is of a fairly standard form, inward looking, with a bright and light interior on two levels and with food courts and a cinema but the outside is grim and now very dated in its style so the plan is to build new outward-facing shops around the outside that will integrate the shopping area into a rapidly growing district in the south harbour with many new apartment buildings. Changes to the market began around 2005 as meat processing here - from the sale of animals and their slaughter and on to finished meat preparation before selling on to shops and commercial buyers - declined. It is still an important part of the day-to-day life of the area but creative industries and restaurants and cafes began to move in alongside the whole-sale food markets and as new neighbours for the meat traders. 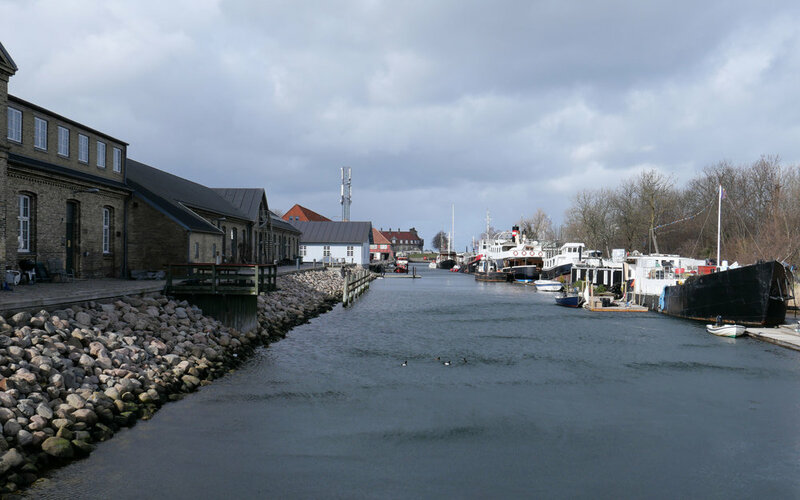 "The local plan area together with Den Brune Kødby has a special atmosphere and authenticity with business, cultural and school and leisure activities in conjunction with the original food-producing wholesale businesses. Market functions, galleries, bars and musicals help create city life 24 hours a day." The local plan for the brown market (Local Plan 262) was produced at the end of 1995 and this report on the White Meat market area should be read alongside the City of Copenhagen Municipal Plan published in 2015. In 2014 a planning decision was made to allow the building of some homes on part of the site … up to 25% by area but mostly on upper floors. In 2017 there was a first official proposal to build a new school on land at the south corner and both will mean the demolition of some existing buildings. This local plan tries to quantify these changes and it indicates that the commercial wholesale food markets and food businesses will be 40% of the usage but the plan specifically acknowledges the potential that the other buildings have for small craft-based industries. The area is surrounded by parts of the city that are themselves undergoing major re-development with changes or new building on former brown-field sights so a coherent policy statement and a long-term plan for the meat markets was required: any plans for the White Meat market also has to be seen in close relationship to developments on the other side of the railway along, Kalvebod Brygge; radical changes along the north side of the area with work on Halmtorvet and along Sønder Boulevard and long-term changes that will come to this part of the city with the opening of a new line of the metro next year. It was construction work for the metro that was the reason why the central part of Sønder Boulevard for the full length of the street was behind massive green fences for years as engineering works for the new line were completed. The published plan has extensive maps that identify the historic buildings and the text describes briefly how the different areas and structures were changed or adapted as their use has changed. An important part of the discussion is about how the squares and open spaces and the roads and paths through the area are laid out and how they are used now and then suggests how they can be improved. This is because the plan has to be integrated with what are, in some cases, competing access requirements for transport into and through the area … so there will be new bike parking at Dybbølsbro - the railway station to the south - bike routes that are cutting through the area have to be considered - so people coming from one place outside the area and going to somewhere outside - and the requirements for safe road systems around the school. There will be tight and necessary restrictions to protect the new metro line tunnels so weight limits for commercial traffic and very clear controls on nearby excavations for new buildings or underground services. It is implied that demolition of some buildings within the area may be allowed for what is considered to be appropriate new buildings so overuse and density of use might become more of an issue … part of the attraction of the area is that it is often empty of people and is an amazing place to explore but that is difficult to maintain or justify in terms of sustainability. There could be a problem with overshadowing and sight lines through and out of the area being compromised by new buildings immediately outside the area. The present sense of large and open spaces are crucial to the character of the area and a serious mistake is being made now with the overdevelopment of the Carlsberg site, where important historic industrial buildings have been swamped by new development, and that should not be repeated here. The report spotlights issues about dealing with potential pollution on land that had heavy industrial use - there was a gas works here and a large cooling plant using large quantities of ammonia - and there will be ongoing problems with bringing more people and a school into an area that is used for industrial processes that means some heavy commercial traffic. There are very clear recommendations for controls for a wider area that is primarily domestic but with social and entertainment uses so premises here can be shops and cafes but not banks or estate agents. The implication is that if an existing building is demolished then the new building must be of the same overall height and number of floors above ground and have the same roof form and have similar facing materials. There are some general points about the protection and conservation of important historic buildings that apply throughout the historic city but this report also points out problems specific to this district so roofs can be green - sown with moss and so on - but not with gardens or living spaces and roof-top service features like ventilation and lift turrets will generally not be allowed to maintain an appropriate silhouette or outline for the buildings in the west part that gain much of their character from having flat roofs. Existing trees, several of which are what are called specimen examples, will be preserved but there are suggestions for planting new trees. For the city as a whole this is clearly a good policy but in this part of the city it was and still is a working area that has practical and often stark urban features and there is a problem if planting, however desirable from an ecological point of view, could make the streetscape here softer and more domesticated and polite than it has ever been. The plan recommends keeping original windows and original glazed doors - in part because of the intrinsic high quality of some of these fittings - that should mean a long potential period of use - but also recommends keeping original glass for the quality of the light and the quality of the external appearance that is rarely matched by modern industrially-produced glass. When discussing architecture in terms of style, or even when setting out the history of a complicated group of buildings like this, it is much too easy to describe a design as say Functionalism without then actually considering what that means. The meat markets were essentially an amazing and highly efficient factory system so if you want to understand why these buildings were designed and built in this particular form then look at the film made of the working market in 1936 but be warned that it is not a film to watch if you don't like to think about what happened to your meat before it went into the plastic tray for the supermarket. The film also raises interesting questions about architecture used to create an impression that wasn't true in its reality - so here Functionalist architecture implying clean, hygienic and efficient design for a process that was far from that. How can a local conservation plan limit the extent to which any important historic building becomes sanitised and divorced from its original function ... the very reasons it was built like that and looks like that? People from other cities and other countries will easily and quickly understand planning policies that talk about creating a green city but it is fascinating that in Copenhagen the planning policies now talk automatically about developing a green and blue city. Open water is now seen as a very positive resource in an urban landscape. If you live in Copenhagen that is hardly surprising … the removal of pollution from the harbour - so people can and do swim anywhere - the long beach front of Amager and Hellerup and now Nordhavn have all been and are continuing to be much appreciated as a public asset and the lakes on the west side of the city are really important in terms of their ecology, in terms of their visual contribution to the streetscape and as a place to walk and relax and socialise so it is hardly surprising that water is now included in all planning assessments but of course this also tallies with the need for detailed planning to cope with climate change and cope with storm rain that often means the construction of new urban water features. Here, in this local plan for the meat markets, controls are outlined for protecting services and plant in buildings if there is a storm and drainage will have to be designed so that in the event of a major storm - often described as a once in a hundred years storm - then the surface water of any flood should be less than 10cm deep. 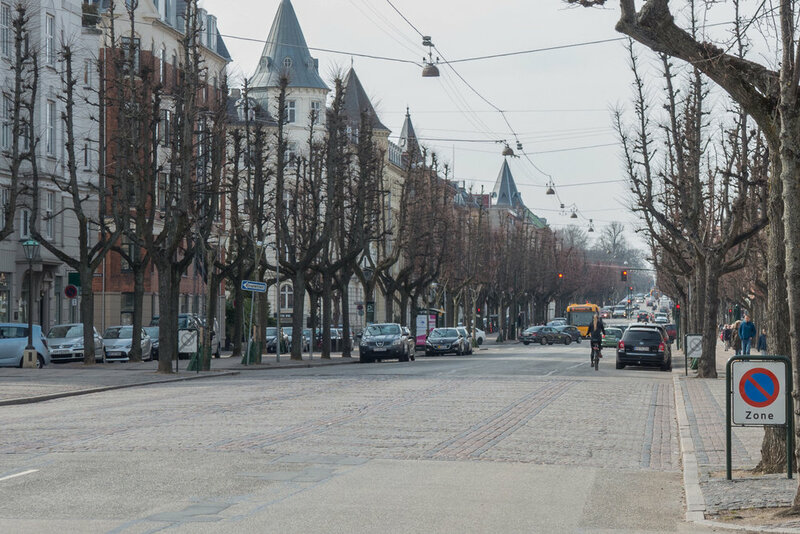 Recently, it was announced that Frederiksberg Allé is to be given special protection with a policy to retain its present character with controls on hard landscaping and planting but also to allow appropriate interventions to enhance the urban landscape. The Allé is a fascinating street with a clear history and a wider importance - an international significance - as it represents a distinct and important phase of planning in the city. It was laid out in 1704 and runs west from Vesterbro to the main entrance to the park and gardens of the royal palace of Frederiksberg. 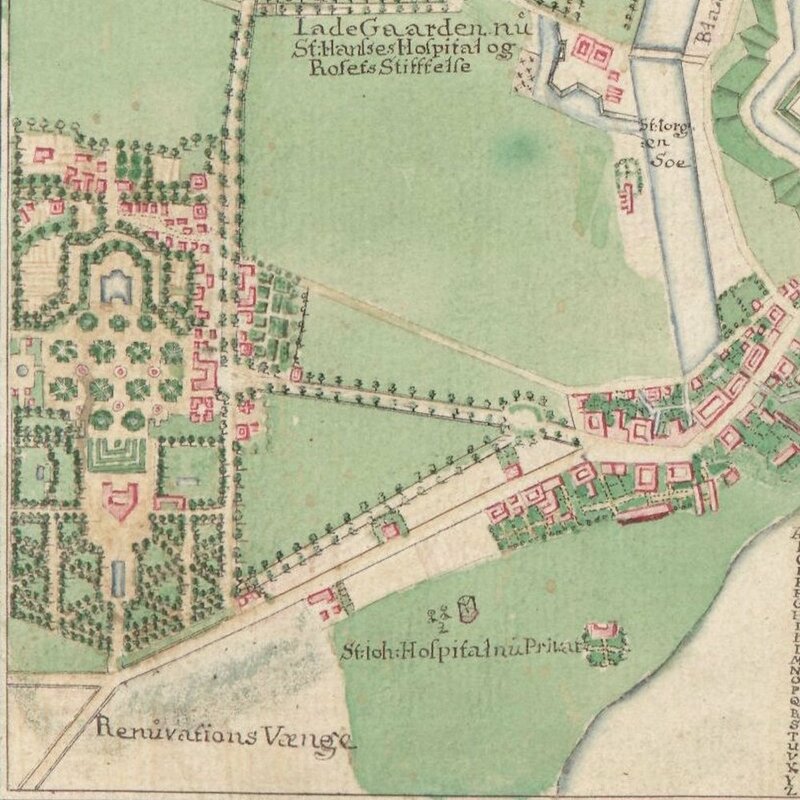 Maps from the 18th century show the road as a broad tree-lined avenue with open fields on either side but, even then, the circle or circus of Sankt Thomas Plads is obvious and there was a large open space at the west end, at the gates to the gardens of the palace. The avenue is now famous for the double lines of lime trees that are pruned to a candelabra shape. There is a wide central road with the double avenue of trees on each side, each with a broad pavement down the centre between the trees, and then secondary or service roads, outside the lines of trees, with wide pavements immediately in front of the buildings. From Sankt Thomas Plads to the gates into the palace gardens is just over a kilometre and the avenue from building front to building front is around 40 metres wide. Buildings along the road are mainly large apartment buildings dating from the 19th century with many being ornate and particularly fine examples of the type. Clearly the Avenue was considered to be a prestigious place to live but also it was established, from an early stage, that this was an area for people to walk - to promenade - and to be entertained so there were theatres, pleasure gardens and cafes along the street. To either side are well-kept streets running back from the Allé with villas, many of a high quality, in terms of historic architecture, and most with well-established and well-planted gardens. The route of the new metro line cuts across the Allé near the centre where there will be a new metro station. As with so many other areas of Copenhagen, the metro station will create a new dynamic to the Allé itself and to the area around. At the end of May, the on-line journal Arkitekten published an interview by Martin Keilding with the architect Jesper Dahl about current planning policy in Frederiksberg. 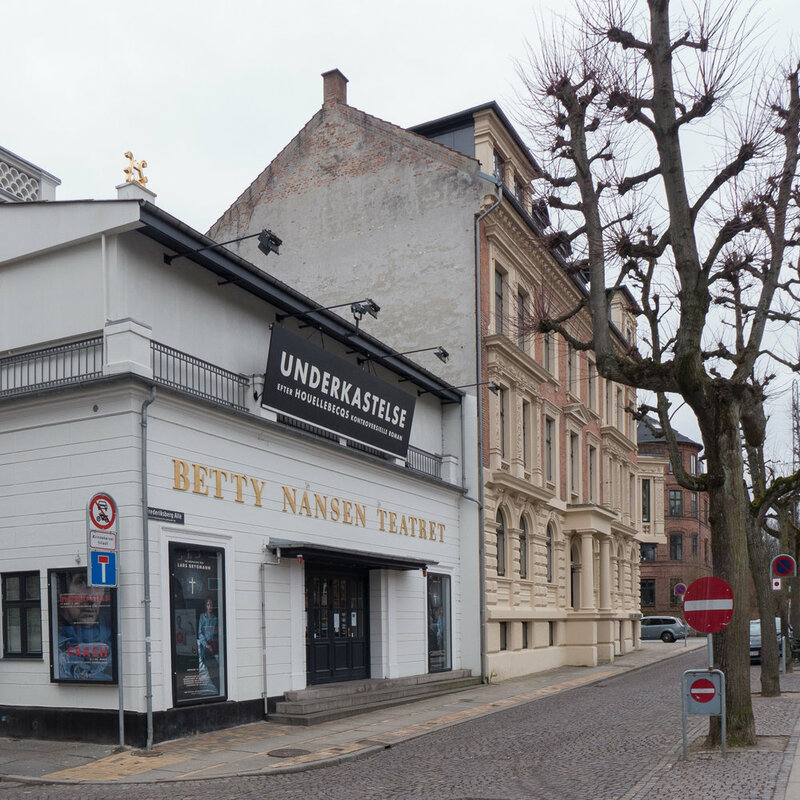 There are may interesting points about the realities of dealing with complicated planning issues in Frederiksberg because it reached its boundaries by the 1950s so all development is, to some extent, redevelopment. One point that might need more general discussion is that planning regulations now allow homes to be built that are 65 square metres or larger where the previous minimum size was 80 square metres. Clearly, at this stage it does not effect the average size of homes in the municipality but ceiling heights, rights to light (or the more serious problem of new buildings throwing a shadow over existing buildings) and density of occupation all have an impact on the quality of life. However, Jesper Dahl makes the important point - and one rarely discussed directly - even in the new Welcome Home exhibition at DAC - that demographics and density are, to a considerable extent, beyond legal planning controls … or, as Dahl explains it, an elderly lady might move out of a large home and six students move in or even two people moving in together in one of the homes they currently occupy all effect how buildings are occupied and are beyond and outside any policy. Even the arguments about redevelopment are not about straightforward calculations of potential profit - in some cases new buildings more densely occupied might see higher returns but also the premium from converting an attractive and prestigious historic building can be highly profitable. What comes across strongly is that what is being protected in Frederiksberg is the general character of the area that has been well established with main streets with a commercial mix of apartments and commercial use but immediately behind, down side roads, blocks of villas and gardens. By the end of the 19th century, Trianglen was a major interchange and terminal for the tram system with lines running north, from the city from Østerport and lines across from east to west from the Free Port to Nørrebro. Just on the south side of Trianglen was a major tram depot designed by Vilhelm Friederichsen and built in 1901. It looks as if at some point the south-west corner of the main tram shed was cut back to form a passageway so trams could head out directly onto Rysegade - the road a block south of Trianglen - and presumably to avoid too many trams crossing over at Trianglen. The buildings have been converted to community use. Trianglen itself is typical of the new suburbs of the city that were built from the 1870s onwards with apartments often over shops or banks and set along broad new streets or around squares at major intersections. There is an extensive area of late 19th-century apartment buildings to the east of Trianglen between the lakes and a new Free Port where there were extensive wharves and warehouses that were constructed around 1900. An oval-shaped building was opened in 1907 with a new kiosk, a waiting room with toilets and an office for the traffic manager for the trams to replace a wooden hut on the site at the centre of the triangle. Designed by P V Jensen-Klint with Poul Baumann, it has a curved and very distinctive copper roof topped by a pair of heraldic animals - actually chimney flues - and the building soon became known as The Terrine although it is also called Bien - The Bee - from one of the commercial names of the kiosk. The monument by the sculptor Axel Poulsen was completed in 1930 to mark the return in 1920 of lands in southern Jutland that had been lost to Germany in the war of 1864. The sculpture on a substantial stone plinth and flanking drinking-water fountains and lights were part of improvements to the entrance to Fælledparken - the large public park - established in 1908 on open land outside the city defences. Designed by Helle Nebelong and opened in 1996 - when Copenhagen was City of Culture - this was the first sensory garden in the country and was designed for children who have problems with access or might have impaired sight. This is a very calm and very beautiful area just to the right as you enter Fælledparken from Trianglen. A large and grand post office with a portico and with the entrance at the top of imposing stone steps. It was designed by Thorvald Jørgensen and opened in 1922. With recent reorganisation of postal services in the city, the post office counter service has been scaled back but this building is now a museum of postal and telegraph services called Enigma. There is a good cafe. Designed by the municipal architect Ludvig Fenger with Ludvig Clausen, the power staion, the third in the city, opened in 1902. With its ornate façade to Øster Allé it forms an important backdrop to the entrance to the park. 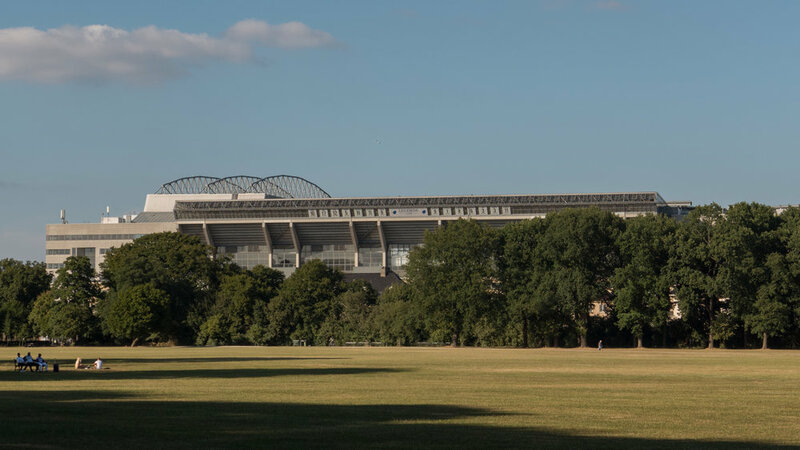 Football was first played here in the 1870s but work on Idrætsparken - a new football stadium - was started in 1908 - just as the public park was established - and it was completed in 1911. The present national stadium is on the same site and is by Gert Andersson and was completed in 1992. 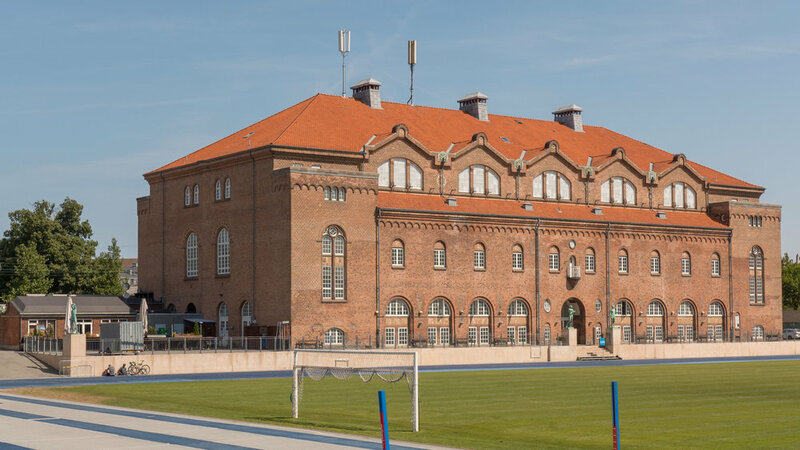 Idræhuset stadium - for gymnastics and field sports - was designed by Søren Lemche and completed in 1914 and Øbro Hal, a swimming pool by Frederik Vilhelm Hvalsoe and Arthur Wittmark, was completed in 1930. 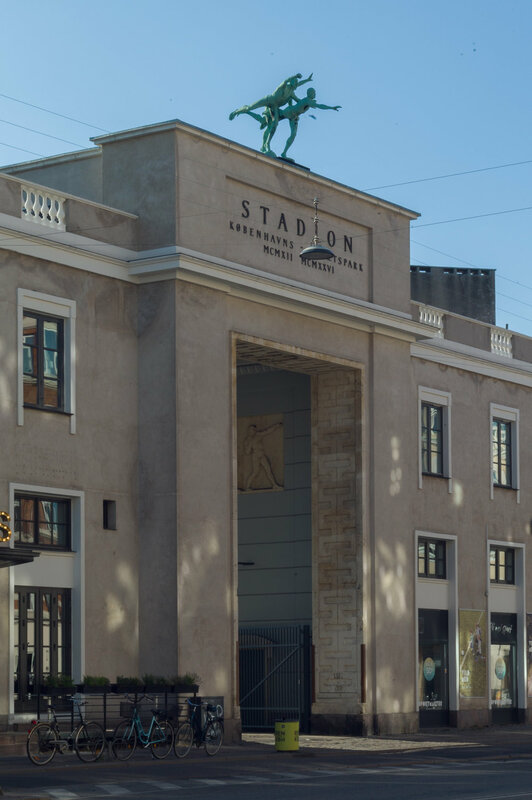 A high arch at the east end of this building was built to form an impressive entrance to the stadium from Østerbrogade. The Medical Association housing scheme was designed by Michael Gottlieb Bindesbøll and Vilhelm Klein and built between 1853 and 1872. These houses were built as a practical response to a major outbreak of cholera in the city in 1853 when 5,000 people died. This heavy loss of life was attributed to the overcrowded and insanitary courtyard housing in the centre of the city and plans were drawn up to demolish old and poorly built housing in the city and build new housing for the rapidly-expanding population of ordinary working families on land outside the city gates, so beyond the old city walls and in new and rapidly-expanding suburbs. The headquarters of the Danish Red Cross is in a building that dates from the 1950s. 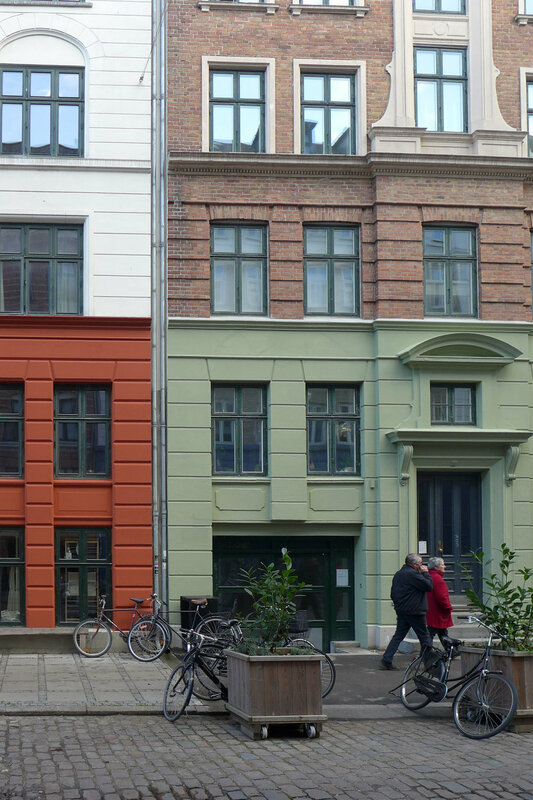 The plot on Blegdamsvej is very wide but with tightly-constricted depth as the building backs on to Fælledparken. An addition to the existing building, designed by the Copenhagen architects COBE, was completed in 2018 to form a new entrance on what was an open area across the front of the building but it also tries to form a new public space with open access from the street withsteps that face south and provide an area for sitting outside. A very large building designed by Holger Rasmussen and built between 1923 and 1927. The entrance has a giant order with two columns that are 16 metres high and are said to weigh 72 tons each. The proportions of the front seem slightly odd and extended and the column bases oddly tight to fit in the restricted space but the render of the façade and the quality of the architectural details could not be better. A general workers' housing association - Arbejdernes Andels Boligforening - the Labour employees Housing Association - was founded in 1912 by Jens Christian Jensen who was the first socialist mayor of the city and was a leading proponent for the public park - Fælledparken - that was established on open common land in Østerbro in 1908. This large apartment building, around three sides of a large open courtyard faces onto Blegdamsvej but the main side ranges return each way along the street and shield long narrow side courtyards. Designed by Bent Helwig-Moller and completed in 1935, most of the apartments run right across the block so are through apartments with windows to both sides. With balconies, lifts and rubbish shutes and a large communal courtyard garden it is typical of the best social housing of the period. Original plans and elevation drawings in the national collection of Danmarks Kunstbibliotek are available on line. Tucked away at the south corner of the park, Tower Playground by GHB Landskabsarkitekter and the Spejlhuset / Mirror House by MLRP were part of extensive improvements made to Fælledparken in 2012.